Journal of the House of Lords Volume 35, 1776-1779. Originally published by His Majesty's Stationery Office, London, 1767-1830. DIE Lunæ, 12o Maii 1777. DIE Martis, 13o Maii 1777. DIE Mercurii, 14o Maii 1777. DIE Jovis, 15o Maii 1777. DIE Veneris, 16o Maii 1777. Epus. Cestrien. Comes Bathurst, Cancellarius. The Lord Scarsdale reported from the Lords Committees, to whom the Bill, intituled, "An Act for widening, cleansing, and lighting, the several Streets, Lanes, Alleys, Ways, and other publick Passages, within the Town of Wolverhampton, in the County of Stafford; and for taking down, altering or re-building certain Buildings therein mentioned; and for removing all other Nuisances and Encroachments; and for regulating Carts and other Carriages within the said Town," was committed: "That they had considered the said Bill, and examined the Allegations thereof, which were found to be true; and that Committee had gone through the Bill, and directed him to report the same to the House, without any Amendment." The Lord Scarsdale made the like Report from the Lords Committees, to whom the Bill, intituled, "An Act for repairing and widening the Road from Gateshead, in the County of Durham, to the Church Lane near Ryton Lane Head, and from the Bar Moor to the Hexham Turnpike Road near Dilston Bar, in the County of Northumberland; and also the Road from Mickley-bank to Lead-hill or Silver-hill; and for making a Road cross certain Grounds belonging to Crozier Surtees Esquire, in the Parish of Ryton, in the County of Durham," was committed. The Lord Scarsdale also reported from the Lords Committees, to whom the Bill, intituled, "An Act for dividing and enclosing the Open Fields, Meadows, Common Pastures, Forest and Waste Grounds, in the Parish of Farnsfield, in the County of Nottingham" was committed: "That they had considered the said Bill, and examined the Allegations thereof, which were found to be true; that the Parties concerned had given their Consents to the Satisfaction of the Committee; and that the Committee had gone through the Bill, and directed him to report the same to the House, without any Amendment." The Lord Scarsdale made the like Report from the Lords Committees, to whom the Bill, intituled, "An Act for dividing and enclosing certain Open Fields, Meadows, Commons, and Waste Grounds, in the Parish of Brampton, in the County of Lincoln," was committed. Halam and Edingley Enclosure Bill. The Lord Scarsdale made the like Report from the Lords Committees, to whom the Bill, intituled, "An Act for dividing and enclosing the Open Fields, Meadows, Commons, and Waste Grounds, within the Parishes of Halam and Edingley, in the County of Nottingham," was committed. The Lord Scarsdale made the like Report from the Lords Committees, to whom the Bill, intituled, "An Act for dividing and enclosing the Open and Common Fields, Commonable Lands, and Waste Grounds, within the Manor and Parish of Leadenham, in the County of Lincoln," was committed. The Lord Scarsdale made the like Report from the Lords Committees, to whom the Bill, intituled, "An Act for dividing, allotting, and enclosing, certain Open and Common Fields, Common Meadows, Common Pastures, Downs, Commons, and other Commonable Lands, within the Township of Uffington and the Hamlets of Balking and Woolston, otherwise Woolverston, and within the Hamlets of Kingston, Lisle, and Fawler, in the County of Berks," was committed. The Lord Scarsdale made the like Report from the Lords Committees, to whom the Bill, intituled, "An Act for dividing and enclosing the Common Fields, Mesne Enclosures, Commons or Waste Grounds, within the Township of Monkbretton, otherwise Burton, in the Parish of Roystone, in the West Riding of the County of York," was committed. The Lord Scarsdale also made the like Report from the Lords Committees, to whom the Bill, intituled, "An Act for dividing and enclosing the Open and Common Fields and certain Commonable Lands, within the Parish of Farmborough, otherwise Farnborough, in the County of Berks," was committed. Hodie 3a vice lecta est Billa, intituled, "An Act for widening, cleansing, and lighting, the several Streets, Lanes, Alleys, Ways, and other publick Passages, within the Town of Wolverhampton, in the County of Stafford; and for taking down, altering or rebuilding certain Buildings therein mentioned; and for removing all other Nuisances and Encroachments; and for regulating Carts and other Carriages within the said Town." Hodie 3a vice lecta est Billa, intituled, "An Act for dividing and enclosing the Open Fields, Meadows, Common Pastures, Forest and Waste Grounds, in the Parish of Farnsfield, in the County of Nottingham." Hodie 3a vice lecta est Billa, intituled, "An Act for repairing and widening the Road from Gateshead, in the County of Durham, to the Church Lane near Ryton Lane Head, and from the Bar Moor to the Hexham Turnpike Road, near Dilston Bar, in the County of Northumberland; and also the Road from Mickleybank to Lead-hill or Silver-hill; and for making a Road cross certain Grounds, belonging to Crozier Surtees Esquire, in the Parish of Ryton, in the County of Durham." Hodie 3a vice lecta est Billa, intituled, "An Act for dividing and enclosing certain Open Fields, Meadows, Commons, and Waste Grounds, in the Parish of Brampton, in the County of Lincoln." Hodie 3a vice lecta est Billa, intituled, "An Act for dividing and enclosing the Open Fields, Meadows, Commons, and Waste Grounds, within the Parishes of Halam and Edingley, in the County of Nottingham." Hodie 3a vice lecta est Billa, intituled, "An Act for dividing and enclosing the Open and Common Fields, Commonable Lands, and Waste Grounds, within the Manor and Parish of Leadenham, in the County of Lincoln." Hodie 3a vice lecta est Billa, intituled, "An Act for dividing, allotting, and enclosing, certain Open and Common Fields, Common Meadows, Common Pastures, Downs, Commons, and other Commonable Lands, within the Township of Uffington, and the Hamlets of Balking and Woolston, otherwise Woolverston, and within the Hamlets of Kingston, Lisle, and Fawler, in the County of Berks." Hodie 3a vice lecta est Billa, intituled, "An Act for dividing and enclosing the Common Fields, Mesne Enclosures, Commons or Waste Grounds, within the Township of Monkbretton, otherwise Burton, in the Parish of Roystone, in the West Riding of the County of York." Hodie 3a vice lecta est Billa, intituled, "An Act for dividing and enclosing the Open and Common Fields, and certain Commonable Lands, within the Parish of Farmborough, otherwise Farnborough, in the County of Berks." Messages to H. C. that the Lords have agreed to the Ninepreceding Bills. 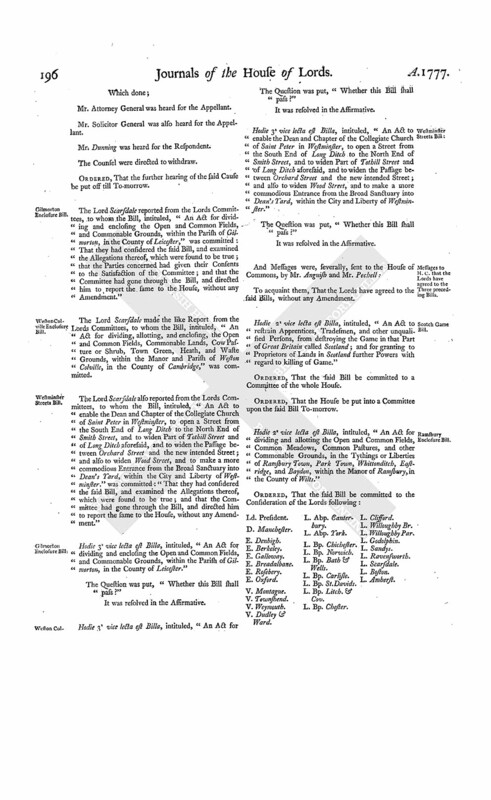 The Lord Scarsdale reported from the Lords Committees, to whom the Bill, intituled, "An Act for dividing and enclosing the Open Fields, Meadows, Pastures, Commons, and Waste Grounds, within the Parish of Bleasby, in the County of Nottingham," was committed: "That they had considered the said Bill, and examined the Allegations thereof, which were found to be true; that the Parties concerned had given their Consents to the Satisfaction of the Committee; and that the Committee had gone through the Bill, and made several Amendments thereto." Pr. 1. L. 18. Leave out ["the Most Noble William Henry Cavendish Duke of Portland, claims to be entitled to"] and insert ["Whereas there is a Manor called"]. Pr. 13. L. 9. Leave out ["said Duke"] and insert ["Lord"]; and in the same Line and Line 10, leave out ["Portland"] and insert ["the Manor of Gourton"]. L. 22. Leave out ["Duke"] and insert ["Lord"]. L. 23. Leave out ["Portland"] and insert ["the Manor of Gourton"]. L. 27. Leave out ["Duke"] and insert ["Lord"]; and in the same Line, leave out ["Portland"] and insert ["the Manor of Gourton"]. Pr. 15. L. 12. Leave out ["Duke of Portland"]. L. 26. Leave out ["said"]. And the said Amendments being again read, were agreed to by the House. Promissory Notes, restraining the Negotiation of, Bill. With a Bill, intituled, "An Act for further restraining the Negotiation of Promissory Notes and Inland Bills of Exchange, under a limited Sum, within that Part of Great Britain called England;" to which they desire the Concurrence of this House. With a Bill, intituled, "An Act for dividing and enclosing the Moors, Commons or Waste Grounds, within the Manors of Baschurch, Hordley, Stanwardine in the Wood, Weston, Lullingfield, and Stanwardine in the Fields, or some of them, in the County of Salop;" to which they desire the Concurrence of this House. Message from H. C. to return Clarke's Bill. To return the Bill, intituled,"An Act to confirm and establish Articles of Agreement for a Partition or Division of Lands and Hereditaments, in the Counties of Northampton and Warwick, the Estates of John Clarke Esquire, and Mary his late Wife, deceased; and for settling the same to the Uses therein mentioned;" and to acquaint this House, That they have agreed to the same, without any Amendment. With a Bill, intituled, "An Act for dividing, allotting, and enclosing, the Open and Common Fields, Common Pastures, Common Meadows, and other Commonable Lands and Grounds, of and within the Manor and Parish of Mears Ashby, in the County of Northampton;" to which they desire the Concurrence of this House. With a Bill, intituled, "An Act for re-building the Bridge over the River Severn, at Maismore, near the City of Gloucester; for raising, widening, and securing Over's Causeway, leading from the said City towards Maismore aforesaid; and for enforcing the proper paving and cleansing of the several Streets within the said City; and for removing Nuisances and Annoyances therefrom, and preventing the like for the future;" to which they desire the Concurrence of this House. With a Bill, intituled, "An Act for enlarging the Term and Powers of an Act, made in the Ninth Year of the Reign of His present Majesty, intituled, "An Act for repairing and widening the Road leading from Tal y Cafn Ferry, in the County of Caernarvon, and through the Towns of Conway, Bangor, and Caernarvon, to the Town of Pwllhely, in the same County;" and also for repairing and widening the Roads from Tal y Cafn Ferry aforesaid, on the Denbighshire Side of the River Conway, to join the Turnpike Road between Conway and Saint Asaph, at a Place called Sarn y Mynech, and from the Turnpike Road between Bangor and Conway, at the Village of Aber, over Bwlch y Ddwyfaen Mountain to Tal y Cafn Ferry aforesaid, and from thence to the Town of Llanrwst, in the County of Denbigh;" to which they desire the Concurrence of this House. Message from H. C. to return E. Tyrconnel's Divorce Bill. To return the Bill, intituled, "An Act to dissolve the Marriage of George Carpenter Esquire, Earl of Tyrconnel, in the Kingdom of Ireland, with the Right Honourable Lady Frances Manners, his now Wife, and to enable him to marry again; and for other Purposes therein mentioned;" and to acquaint this House, That they have agreed to the same, without any Amendment. Rebow to take the Name of Martin, Bill. Hodie 1a vice lecta est Billa, intituled, "An Act to enable Isaac Martin Rebow Esquire, to take and use the Surname of Martin, pursuant to the Will of Matthew Martin Esquire, deceased." Hodie 1a vice lecta est Billa, intituled, "An Act for dividing, allotting, and enclosing, the Open Fields, Common Pastures, and Moor or Common, in the Parish of Bulmer, in the North Riding of the County of York." Hodie 1a vice lecta est Billa, intituled, "An Act for dividing and enclosing Corfton Wood, otherwise Corveton Wood or Common, within the Manor of Corfton, otherwise Corveton, and Parish of Diddlebury, in the County of Salop; and for making a Boundary or Ring Fence, against a certain Open and un-enclosed Ground, in the Manor of Corpham, within the same Parish." Tea, to prevent manufacturing Ash, &c. to imitate, Bill. Hodie 1a vice lecta est Billa, intituled, "An Act for the more effectual Prevention of the manufacturing of Ash, Elder, Sloe, and other Leaves, in Imitation of Tea; and to prevent Frauds in the Revenue of Excise in respect to Tea." Life Annuities, registering the Grants of, &c. Bill. With a Bill, intituled, "An Act for registering the Grants of Life Annuities; and for the better Protection of Infants against such Grants;" to which they desire the Concurrence of this House. America, &c. allowing the Exportation of Wheat, &c. to, Bill. Hodie 2a vice lecta est Billa, intituled, "An Act to revive and continue such Part of an Act, made in the last Session of Parliament, intituled, "An Act for allowing the Exportation of certain Quantities of Wheat and other Articles, to His Majesty's Sugar Colonies in America, and to the Island of Saint Helena, and to the other Settlements belonging to the United Company of Merchants of England trading to the East In dies; and of Biscuit and Pease to Newfoundland, Nova Scotia, Bay Chaleur, and Labrador; and for indemnifying all Persons with respect to advising of carrying into Execution His Majesty's Orders of Council already made for allowing the Exportation of Wheat and other Articles," as expired on the First Day of January One thousand seven hundred and seventy-seven." Hodie 2a vice lecta est Billa, intituled, "An Act for dividing, allotting, and enclosing, the Open and Common Fields, Commonable Lands, Cow Pasture or Shrub, Town Green, Heath, and Waste Grounds, within the Manor and Parish of Weston Colville, in the County of Cambridge." E. Oxford. L. Bp. Ely. L. Bp. Chester. L. Clifford. Hodie 2a vice lecta est Billa, intituled, "An Act for dividing and enclosing the Open and Common Fields, and Commonable Grounds, within the Parish of Gilmorton, in the County of Leicester." Limitation of Causes this Session. Ordered, That this House will hear no more Causes this Session after that wherein Pinckney Wilkinson Esquire, is Appellant, and Bryan Allott Clerk, is Respondent, which stands appointed for To-morrow. Wilkinson against Allott. Mr. Baron Perryn to attend. Ordered, That Mr. Baron Perryn do attend this House To-morrow, upon the hearing of the Cause, wherein Pinckney Wilkinson Esquire, is Appellant, and Bryan Allott Clerk, Respondent, with the Report made to him by Mr. Serjeant Sayer, of the Evidence given on the Trial of an Issue in 1776, at the Summer Assizes for the County of Norfolk, directed by the Court of Exchequer, wherein Bryan Allott Clerk was Plaintiff, and Pinckney Wilkinson Esquire, Defendant. Common Fields, &c. Cultivation of, Bill. Ordered, That the Bill, intituled, "An Act for the further advancing the Cultivation, Improvement, and Regulation of the Common Arable Fields, Common Meadows, and Commons of Pasture, in this Kingdom," be read a Second Time on this Day Two Months. Tea to Ireland, allowing Drawback on, Bill. With a Bill, intituled, "An Act for allowing a Drawback of the Duties of Customs on the Exportation of Tea to Ireland;" to which they desire the Concurrence of this House. 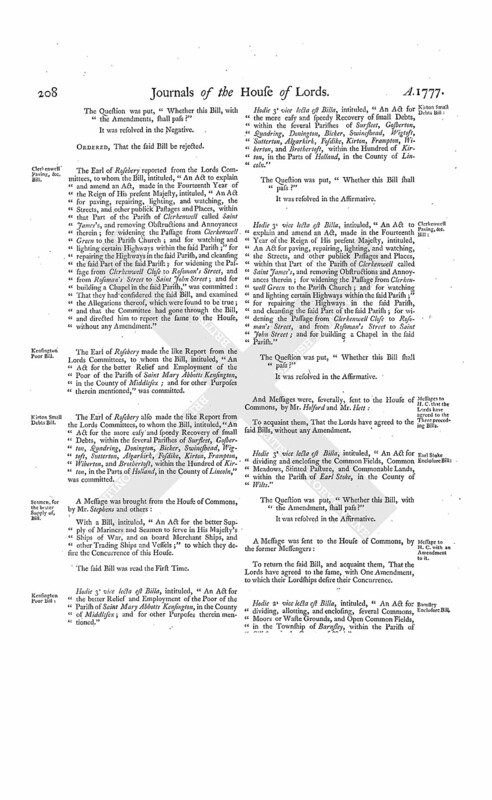 With a Bill, intituled, "An Act for dividing and allotting the Open and Common Fields, Common Meadows, Common Pastures, and other Commonable Grounds, in the Tythings or Liberties of Ramsbury Town, Park Town, Whittonditch, Eastridge, and Baydon, within the Manor of Ramsbury, in the County of Wilts;" to which they desire the Concurrence of this House. Dominus Cancellarius declaravit præsens Parliamentum continuandum esse usque ad et in diem Martis, decimum tertium diem instantis Maii, horâ undecima Auroræ, Dominis sic decernentibus. Viscount Dudley & Ward. Ds. Clifford. Mr. Attorney General was heard for the Appellant. Mr. Solicitor General was also heard for the Appellant. Mr. Dunning was heard for the Respondent. Ordered, That the further hearing of the said Cause be put off till To-morrow. The Lord Scarsdale reported from the Lords Committees, to whom the Bill, intituled, "An Act for dividing and enclosing the Open and Common Fields, and Commonable Grounds, within the Parish of Gilmorton, in the County of Leicester," was committed: That they had considered the said Bill, and examined the Allegations thereof, which were found to be true; that the Parties concerned had given their Consents to the Satisfaction of the Committee; and that the Committee had gone through the Bill, and directed him to report the same to the House, without any Amendment." The Lord Scarsdale made the like Report from the Lords Committees, to whom the Bill, intituled, "An Act for dividing, allotting, and enclosing, the Open and Common Fields, Commonable Lands, Cow Pasture or Shrub, Town Green, Heath, and Waste Grounds, within the Manor and Parish of Weston Colville, in the County of Cambridge," was committed. The Lord Scarsdale also reported from the Lords Committees, to whom the Bill, intituled, "An Act to enable the Dean and Chapter of the Collegiate Church of Saint Peter in Westminster, to open a Street from the South End of Long Ditch to the North End of Smith Street, and to widen Part of Tothill Street and of Long Ditch aforesaid, and to widen the Passage between Orchard Street and the new intended Street; and also to widen Wood Street, and to make a more commodious Entrance from the Broad Sanctuary into Dean's Yard, within the City and Liberty of Westminster," was committed: "That they had considered the said Bill, and examined the Allegations thereof, which were found to be true; and that the Committee had gone through the Bill, and directed him to report the same to the House, without any Amendment." Hodie 3a vice lecta est Billa, intituled, "An Act for dividing and enclosing the Open and Common Fields, and Commonable Grounds, within the Parish of Gilmorton, in the County of Leicester." Hodie 3a vice lecta est Billa, intituled, "An Act for dividing, allotting, and enclosing, the Open and Common Fields, Commonable Lands, Cow Pasture or Shrub, Town Green, Heath, and Waste Grounds, within the Manor and Parish of Weston Colville, in the County of Cambridge." The Question was put, " Whether this Bill shall pass ?" Hodie 3a vice lecta est Billa, intituled, "An Act to enable the Dean and Chapter of the Collegiate Church of Saint Peter in Westminster, to open a Street from the South End of Long Ditch to the North End of Smith Street, and to widen Part of Tothill Street and of Long Ditch aforesaid, and to widen the Passage between Orchard Street and the new intended Street; and also to widen Wood Street, and to make a more commodious Entrance from the Broad Sanctuary into Dean's Yard, within the City and Liberty of Westminster." Hodie 2a vice lecta est Billa, intituled, "An Act to restrain Apprentices, Tradesmen, and other unqualified Persons, from destroying the Game in that Part of Great Britain called Scotland; and for granting to Proprietors of Lands in Scotland further Powers with regard to killing of Game." Hodie 2a vice lecta est Billa, intituled, "An Act for dividing and allotting the Open and Common Fields, Common Meadows, Common Pastures, and other Commonable Grounds, in the Tythings or Liberties of Ramsbury Town, Park Town, Whittonditch, Eastridge, and Baydon, within the Manor of Ramsbury, in the County of Wilts." V. Dudley & Ward. L. Abp. Canterbury. Hodie 2a vice lecta est Billa, intituled, "An Act for dividing, allotting, and enclosing, the Open and Common Fields, Common Pastures, Common Meadow, and other Commonable Lands and Grounds, of and within the Manor and Parish of Mears Ashby, in the County of Northampton." Hodie 2a vice lecta est Billa, intituled, "An Act for dividing and enclosing Corfton Wood, otherwise Corveton Wood or Common, within the Manor of Corfton, otherwise Corveton, and Parish of Diddlebury, in the County of Salop; and for making a Boundary or Ring Fence against a certain Open and un-enclosed Ground, in the Manor of Corpham, within the same Parish." Hodie 2a vice lecta est Billa, intituled, "An Act for dividing, allotting, and enclosing, the Open Fields, Common Pastures, and Moor or Common, in the Parish of Bulmer, in the North Riding of the County of York." 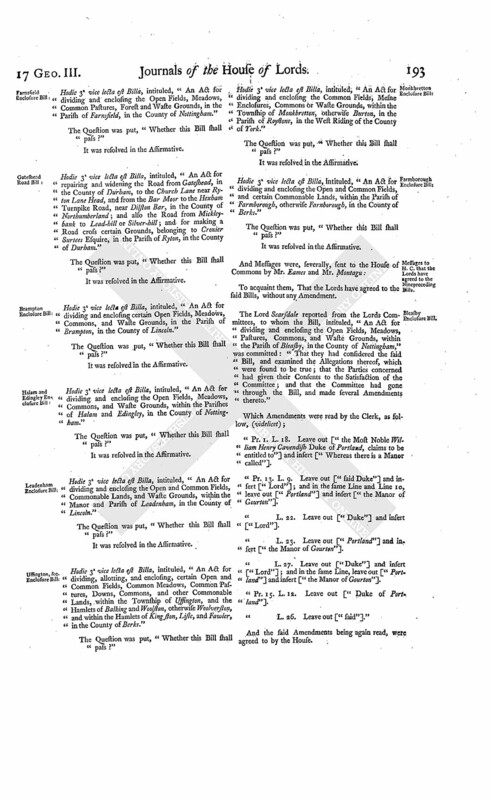 Hodie 2a vice lecta est Billa, intituled, "An Act for dividing and enclosing the Moors, Commons or Waste Grounds, within the Manors of Baschurch, Hordley, Stanwardine in the Wood, Weston, Lullingfield, and Stanwardine in the Fields, or some of them, in the County of Salop." Hodie 2a vice lecta est Billa, intituled, "An Act for enlarging the Term and Powers of an Act, made in the Ninth Year of the Reign of His present Majesty, intituled, "An Act for repairing and widening the Road leading from Tal y Cafn Ferry, in the County of Caernarvon, and through the Towns of Conway, Bangor, and Caernarvon, to the Town of Pwllhely, in the same County;" and also for repairing and widening the Roads from Tal y Cafn Ferry aforesaid, on the Denbighshire Side of the River Conway, to join the Turnpike Road between Conway and Saint Asaph, at a Place called Sarn y Mynech, and from the Turnpike Road between Bangor and Conway, at the Village of Aber, over Bwlch y Ddwyfaen Mountain to Tal y Cafn Ferry aforesaid, and from thence to the Town of Llanrwst, in the County of Denbigh." Ramsbury Enclosure Bill, King's Consent signfied. The Lord Chancellor acquainted the House, "That His Majesty having been informed of the Contents of the Bill, intituled, "An Act for dividing and allotting the Open and Common Fields, Common Meadows, Common Pastures, and other Commonable Grounds, in the Tythings or Liberties of Ramsbury Town, Park Town, Whittonditch, Eastridge, and Baydon, within the Manor of Ramsbury, in the County of Wilts;" was pleased to consent (as far as His Majesty's Interest is concerned), That their Lordships may proceed therein as they shall think fit." Hodie 2a vice lecta est Billa, intituled, "An Act for amending and rendering more effectual Two Acts of Parliament, One made in the Eighth Year of the Reign of His late Majesty, and the other, in the Seventh Year of the Reign of His present Majesty, for Encouragement of the Arts of designing, engraving, and etching Historical and other Prints; and for making further Provision to secure the Property of Prints to the Inventors and Engravers thereof." Hodie 2a vice lecta est Billa, intituled, "An Act for further restraining the Negotiation of Promissory Notes and Inland Bills of Exchange, under a limited Sum, within that Part of Great Britain called England." Hodie 2a vice lecta est Billa, intituled, "An Act for registering the Grants of Life Annuities; and for the better Protection of Infants against such Grants." Tea to Ireland, allowing Drawback, Bill. Hodie 2a vice lecta est Billa, intituled, "An Act for allowing a Drawback of the Duties of Customs on the Exportation of Tea to Ireland." Tea, to prevent manufacturing Ash &c. in Imitation of, Bill. Hodie 2a vice lecta est Billa, intituled, "An Act for the more effectual Prevention of the manufacturing of Ash, Elder, Sloe, and other Leaves, in Imitation of Tea; and to prevent Frauds in the Revenue of Excise in respect to Tea." Hodie 1a vice lecta est Billa, intituled, "An Act for re-building the Bridge over the River Severn, at Maismore, near the City of Gloucester; for raising, widening, and securing, Over's Causeway, leading from the said City towards Maismore aforesaid; and for enforcing the proper paving and cleansing of the several Streets within the said City; and for removing Nuisances and Annoyances therefrom, and preventing the like for the future." Hodie 3a vice lecta est Billa, intituled, "An Act for dividing and enclosing the Open Fields, Meadows, Pastures, Commons, and Waste Grounds, within the Parish of Bleasby, in the County of Nottingham." To return the said Bill, and acquaint them, That the Lords have agreed to the said Bill, with some Amendments, to which their Lordships desire their Concurrence. Rebow to take the Name of Martin Bill. Hodie 2a vice lecta est Billa, intituled, "An Act to enable Isaac Martin Rebow Esquire, to take and use the Surname of Martin, pursuant to the Will of Matthew Martin Esquire, deceased." Message from H. C. to return Klanert's Nat. Bill. To return the Bill, intituled, "An Act for naturalizing Charles Morris Klanert;" and to acquaint this House, That they have agreed to the same, without any Amendment. With a Bill, intituled, "An Act for dividing and enclosing the several Commons and Waste Grounds, within the Manor and Parish of Ipstones, in the County of Stafford;" to which they desire the Concurrence of this House. With a Bill, intituled, "An Act for dividing and enclosing the Common Fields, Common Meadow, Stinted Pasture, and Commonable Lands, within the Parish of Earl Stoke, in the County of Wilts;" to which they desire the Concurrence of this House. Shapwick Moor Enclosure Bill: Petitions against. 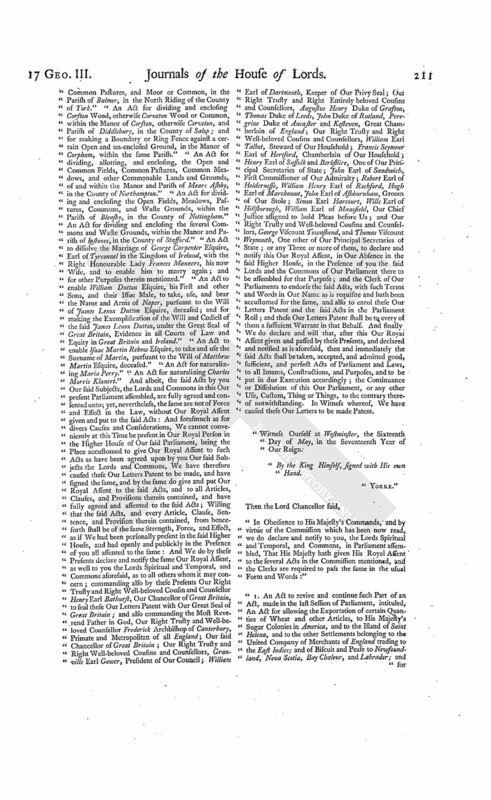 And also; Upon reading the Petition of the several Persons whose Names are thereunto subscribed, taking Notice of a Bill depending in this House, intituled, "An Act for dividing and enclosing the Common or Waste Ground, called Shapwick Moor, or Shapwick Turf Moor, in the Parish of Shapwick, in the County of Somerset;" and praying, "That they may be heard by themselves, Counsel or Agents, against the Whole or such Parts of the said Bill as they shall be advised:"
It is Ordered, That the Petitioners be at Liberty to be heard by their Counsel against the said Bill, as desired, at the Second Reading thereof; and that Counsel be heard for the said Bill, at the same Time, if they think fit. Hat Manufactory Bill: Petition against. 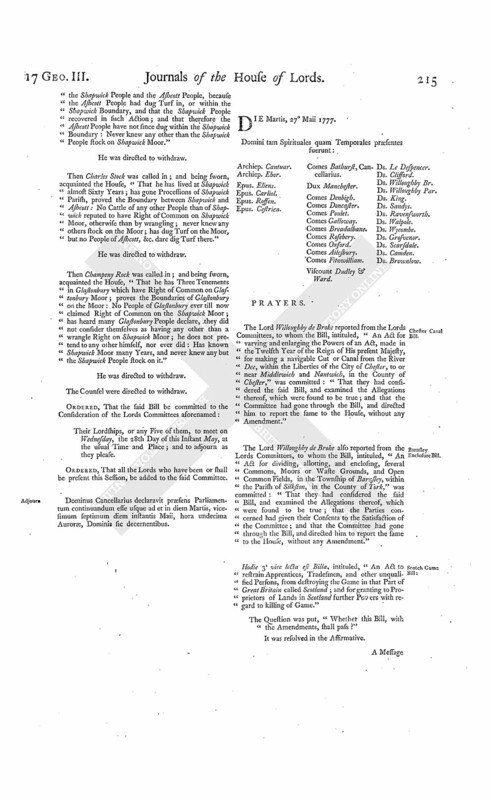 Upon reading the Petition of the Masters and Journeymen Felt-makers, whose Names are thereunto subscribed, resident in and about the City of Bristol, taking Notice of a Bill depending in this House, intituled, "An Act for the better regulating the Hat Manufactory;" and praying their Lordships "will not repeal the several Acts of Parliament made and passed in the Eighth Year of the Reign of Her late Majesty Queen Elizabeth, and the First Year of the Reign of His late Majesty King James the First:"
It is Ordered, That the said Petition be referred to the Committee of the whole House, to whom the said Bill stands committed. The House (according to Order) was adjourned during Pleasure, and put into a Committee upon the Bill, intituled, "An Act to revive and continue such Part of an Act, made in the last Session of Parliament, intituled, "An Act for allowing the Exportation of certain Quantities of Wheat and other Articles to His Majesty's Sugar Colonies in America, and to the Island of Saint Helena, and to the other Settlements belonging to the United Company of Merchants of England trading to the East Indies; and of Biscuit and Pease to Newfoundland, Nova Scotia, Bay Chaleur, and Labrador; and for indemnifying all Persons with respect to advising or carrying into Execution His Majesty's Orders of Council already made, for allowing the Exportation of Wheat and other Articles," as expired on the First Day of January One thousand seven hundred and seventy-seven." Hodie 3a vice lecta est Billa, intituled, "An Act to revive and continue such Part of an Act, made in the last Session of Parliament, intituled, "An Act for allowing the Exportation of certain Quantities of Wheat and other Articles to His Majesty's Sugar Colonies in America, and to the Island of Saint Helena, and to the other Settlements belonging to the United Company of Merchants of England trading to the East Indies; and of Biscuit and Pease to Newfoundland, Nova Scotia, Bay Chaleur, and Labrador; and for indemnifying all Persons with respect to advising or carrying into Execution His Majesty's Orders of Council already made, for allowing the Exportation of Wheat and other Articles," as expired on the First Day of January One thousand seven hundred and seventy-seven." Dominus Cancellarius declaravit præsens Parliamentum continuandum esse usque ad et in diem Mercurii, decimum quartum diem instantis Maii, hora undecima Auroræ, Dominis sic decernentibus. Counsel (according to Order) were called in to be further heard in the Cause wherein Pinckney Wilkinson Esquire, is Appellant, and Bryan Allott Clerk, is Respondent. Mr. Partridge was heard for the Respondent. Mr. Attorney General was heard to reply. 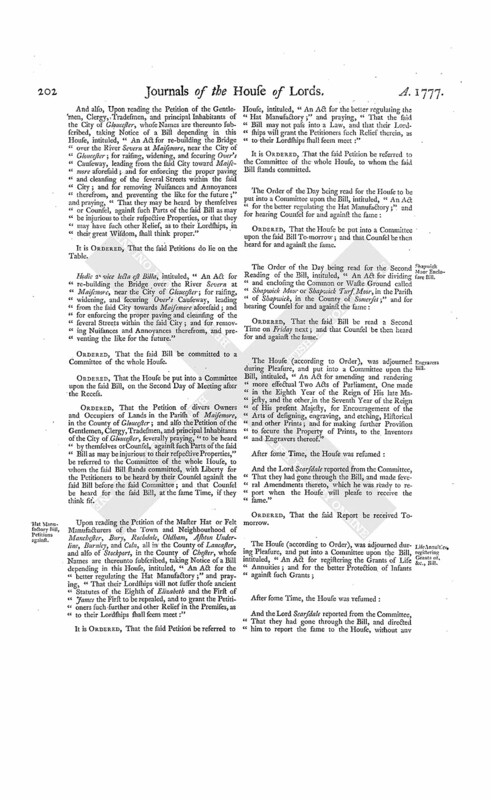 It is Ordered and Adjudged by the Lords Spiritual and Temporal, in Parliament assembled, That the said Petition and Appeal be, and is hereby dismissed this House; and that the said Order therein complained of, be, and the same is hereby Affirmed; and it is further ordered, That the Appellant do pay, or cause to be paid, to the said Respondent, the Sum of One hundred Pounds for his Costs, in respect of the said Appeal. 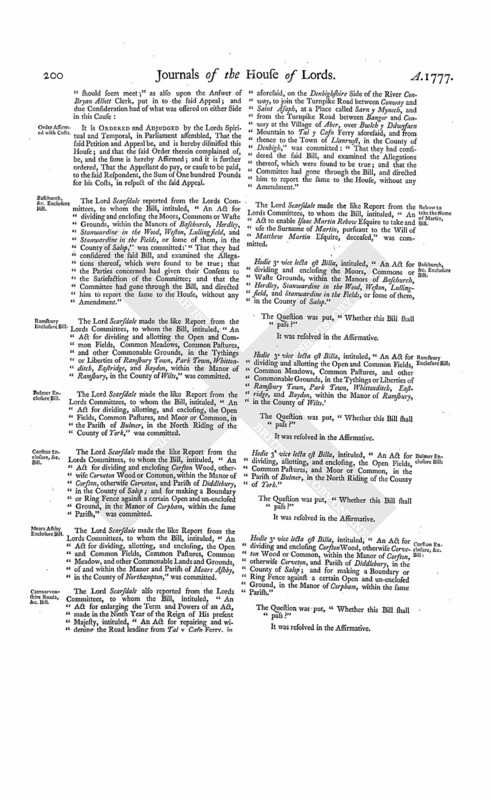 The Lord Scarsdale reported from the Lords Committees, to whom the Bill, intituled, "An Act for dividing and enclosing the Moors, Commons or Waste Grounds, within the Manors of Baschurch, Hordley, Stanwardine in the Wood, Weston, Lulling field, and Stanwardine in the Fields, or some of them, in the County of Salop," was committed: "That they had considered the said Bill, and examined the Allegations thereof, which were found to be true; that the Parties concerned had given their Consents to the Satisfaction of the Committee; and that the Committee had gone through the Bill, and directed him to report the same to the House, without any Amendment." 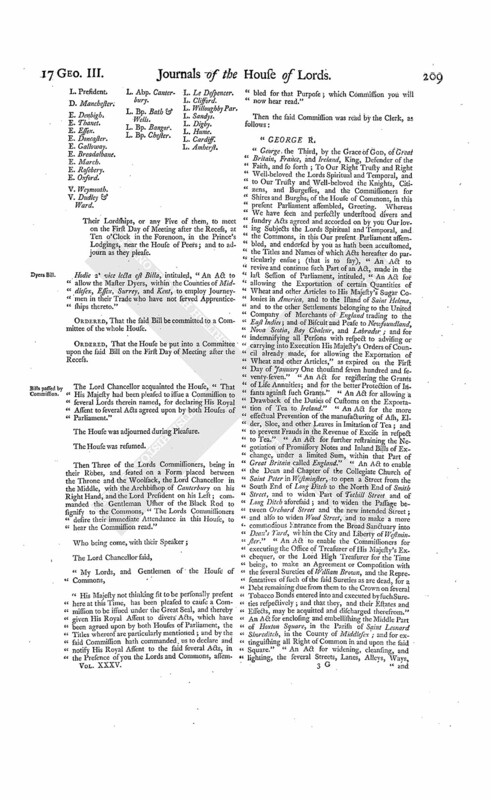 The Lord Scarsdale made the like Report from the Lords Committees, to whom the Bill, intituled, "An Act for dividing and allotting the Open and Common Fields, Common Meadows, Common Pastures, and other Commonable Grounds, in the Tythings or Liberties of Ramsbury Town, Park Town, Whittonditch, Eastridge, and Baydon, within the Manor of Ramsbury, in the County of Wilts," was committed. The Lord Scarsdale made the like Report from the Lords Committees, to whom the Bill, intituled, "An Act for dividing, allotting, and enclosing, the Open Fields, Common Pastures, and Moor or Common, in the Parish of Bulmer, in the North Riding of the County of York," was committed. The Lord Scarsdale made the like Report from the Lords Committees, to whom the Bill, intituled, "An Act for dividing and enclosing Corfton Wood, otherwise Corveton Wood or Common, within the Manor of Corfton, otherwise Corveton, and Parish of Diddlebury, in the County of Salop; and for making a Boundary or Ring Fence against a certain Open and un-enclosed Ground, in the Manor of Corpham, within the same Parish," was committed. The Lord Scarsdale made the like Report from the Lords Committees, to whom the Bill, intituled, "An Act for dividing, allotting, and enclosing, the Open and Common Fields, Common Pastures, Common Meadow, and other Commonable Lands and Grounds, of and within the Manor and Parish of Mears Ashby, in the County of Northampton," was committed. The Lord Scarsdale also reported from the Lords Committees, to whom the Bill, intituled, "An Act for enlarging the Term and Powers of an Act, made in the Ninth Year of the Reign of His present Majesty, intituled, "An Act for repairing and widening the Road leading from Tal y Cafn Ferry, in the County of Caernarvon, and through the Town of Conway, Bangor, and Caernarvon, to the Town of Pwllhely, in the same County;" and also for repairing and widening the Roads from Tal y Cafn Ferry aforesaid, on the Denbighshire Side of the River Conway, to join the Turnpike Road between Conway and Saint Asaph, at a Place called Sarn y Mynech, and from the Turnpike Road between Bangor and Conway at the Village of Aber, over Bwlch y Ddwyfaen Mountain to Tal y Cafn Ferry aforesaid, and from thence to the Town of Llanrwst, in the County of Denbigh," was committed: "That they had considered the said Bill, and examined the Allegations thereof, which were found to be true; and that the Committee had gone through the Bill, and directed him to report the same to the House, without any Amendment." The Lord Scarsdale made the like Report from the Lords Committees, to whom the Bill, intituled, "An Act to enable Isaac Martin Rebow Esquire to take and use the Surname of Martin, pursuant to the Will of Matthew Martin Esquire, deceased," was committed. Hodie 3a vice lecta est Billa, intituled, "An Act for dividing and enclosing the Moors, Commons or Waste Grounds, within the Manors of Baschurch, Hordley, Stanwardine in the Wood, Weston, Lullingfield, and Stanwardine in the Fields, or some of them, in the County of Salop." Hodie 3a vice lecta est Billa, intituled, "An Act for dividing and allotting the Open and Common Fields, Common Meadows, Common Pastures, and other Commonable Grounds, in the Tythings or Liberties of Ramsbury Town, Park Town, Whittonditch, Eastridge, and Baydon, within the Manor of Ramsbury, in the County of Wilts." Hodie 3a vice lecta est Billa, intituled, "An Act for dividing, allotting, and enclosing, the Open Fields, Common Pastures, and Moor or Common, in the Parish of Bulmer, in the North Riding of the County of York." Hodie 3a vice lecta est Billa, intituled, "An Act for dividing and enclosing Corfton Wood, otherwise Corveton Wood or Common, within the Manor of Corfton, otherwise Corveton, and Parish of Diddlebury, in the County of Salop; and for making a Boundary or Ring Fence against a certain Open and un-enclosed Ground, in the Manor of Corpham, within the same Parish." 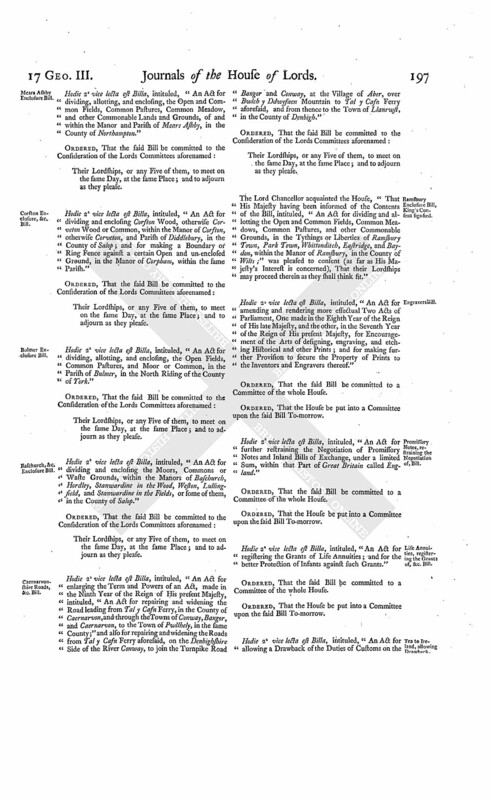 Hodie 3a vice lecta est Billa, intituled, "An Act for dividing, allotting, and enclosing, the Open and Common Fields, Common Pastures, Common Mea dow, and other Commonable Lands and Grounds, of and within the Manor and Parish of Mears Ashby, in the County of Northampton." Hodie 3a vice lecta est Billa, intituled, "An Act for enlarging the Term and Powers of an Act, made in the Ninth Year of the Reign of His present Majesty, intituled, "An Act for repairing and widening the Road leading from Tal y Cafn Ferry, in the County of Caernarvon, and through the Towns of Conway, Bangor, and Caernarvon, to the Town of Pwllhely in the same County;" and also for repairing and widening the Roads from Tal y Caln Ferry aforesaid, on the Denbighshire Side of the River Conway, to join the Turnpike Road between Conway and Saint Asaph at a Place called Sarn y Mynech, and from the Turnpike Road between Bangor and Conway at the Village of Aber over Bwlch y Ddwyfaen Mountain, to Tal y Cafn Ferry aforesaid, and from thence to the Town of Llanrwst, in the County of Denbigh." Hodie 3a vice lecta est Billa, intituled, "An Act to enable Isaac Martin Rebow Esquire, to take and use the Surname of Martin, pursuant to the Will of Matthew Martin Esquire, deceased." Bp. London takes the Oaths, &c.
This Day, Robert Lord Bishop of London took the Oaths, and made and subscribed the Declaration, and also took and subscribed the Oath of Abjuration, pursuant to the Statutes. Message from H. C. to return Bleasby Enclosure Bill. To return the Bill, intituled, "An Act for dividing and enclosing the Open Fields, Meadows, Pastures, Commons, and Waste Grounds, within the Parish of Bleasby, in the County of Nottingham;" and to acquaint this House, That they have agreed to their Lordships Amendments made thereto. With a Bill, intituled, "An Act for the more easy and speedy Recovery of small Debts, within the several Parishes of Surfleet, Gosberton, Quadring, Donington, Bicker, Swineshead, Wigtoft, Sutterton, Algarkirk, Fosdike, Kirton, Frampton, Wilberton, and Brothertoft, within the Hundred of Kirton, in the Parts of Holland, in the County of Lincoln;" to which they desire the Concurrence of this House. 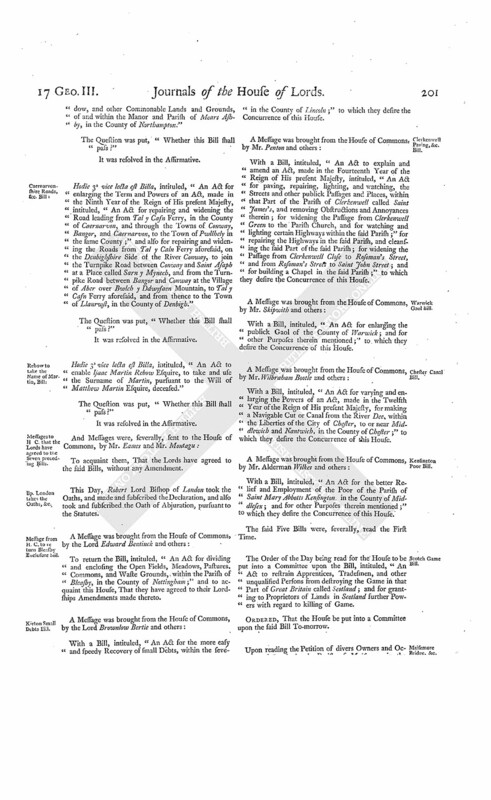 With a Bill, intituled, "An Act to explain and amend an Act, made in the Fourteenth Year of the Reign of His present Majesty, intituled, "An Act for paving, repairing, lighting, and watching, the Streets and other publick Passages and Places, within that Part of the Parish of Clerkenwell called Saint James's, and removing Obstructions and Annoyances therein; for widening the Passage from Clerkenwell Green to the Parish Church, and for watching and lighting certain Highways within the said Parish;" for repairing the Highways in the said Parish, and cleansing the said Part of the said Parish; for widening the Passage from Clerkenwell Close to Rosoman's Street, and from Rosoman's Street to Saint John Street; and for building a Chapel in the said Parish;" to which they desire the Concurrence of this House. With a Bill, intituled, "An Act for enlarging the publick Gaol of the County of Warwick; and for other Purposes therein mentioned;" to which they desire the Concurrence of this House. With a Bill, intituled, "An Act for varying and enlarging the Powers of an Act, made in the Twelfth Year of the Reign of His present Majesty, for making a Navigable Cut or Canal from the River Dee, within the Liberties of the City of Chester, to or near Middlewich and Nantwich, in the County of Chester;" to which they desire the Concurrence of this House. With a Bill, intituled, "An Act for the better Relief and Employment of the Poor of the Parish of Saint Mary Abbotts Kensington in the County of Middlesex; and for other Purposes therein mentioned;" to which they desire the Concurrence of this House. 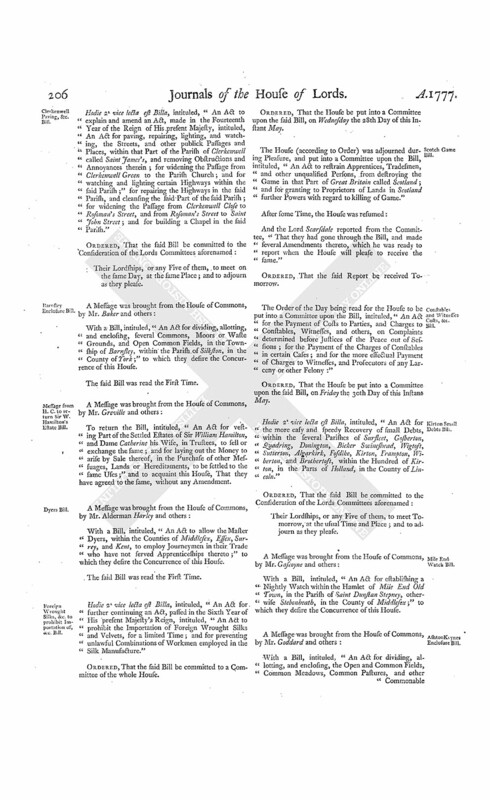 The Order of the Day being read for the House to be put into a Committee upon the Bill, intituled, "An Act to restrain Apprentices, Tradesmen, and other unqualified Persons from destroying the Game in that Part of Great Britain called Scotland; and for granting to Proprietors of Lands in Scotland further Powers with regard to killing of Game. Maisemore Bridge, &c. Bill, Petitions against. And also, Upon reading the Petition of the Gentlemen, Clergy, Tradesmen, and principal Inhabitants of the City of Gloucester, whose Names are thereunto subscribed, taking Notice of a Bill depending in this House, intituled, "An Act for re-building the Bridge over the River Severn at Maisemore, near the City of Gloucester; for raising, widening, and securing Over's Causeway, leading from the said City toward Maisemore aforesaid; and for enforcing the proper paving and cleansing of the several Streets within the said City; and for removing Nuisances and Annoyances therefrom, and preventing the like for the future;" and praying, "That they may be heard by themselves or Counsel, against such Parts of the said Bill as may be injurious to their respective Properties, or that they may have such other Relief, as to their Lordships, in their great Wisdom, shall think proper." Hodie 2a vice lecta est Billa, intituled, "An Act for re-building the Bridge over the River Severn at Maisemore, near the City of Gloucester; for raising, widening, and securing Over's Causeway, leading from the said City towards Maisemore aforesaid; and for enforcing the proper paving and cleansing of the several Streets within the said City; and for removing Nuisances and Annoyances therefrom, and preventing the like for the future." Ordered, That the House be put into a Committee upon the said Bill, on the Second Day of Meeting after the Recess. 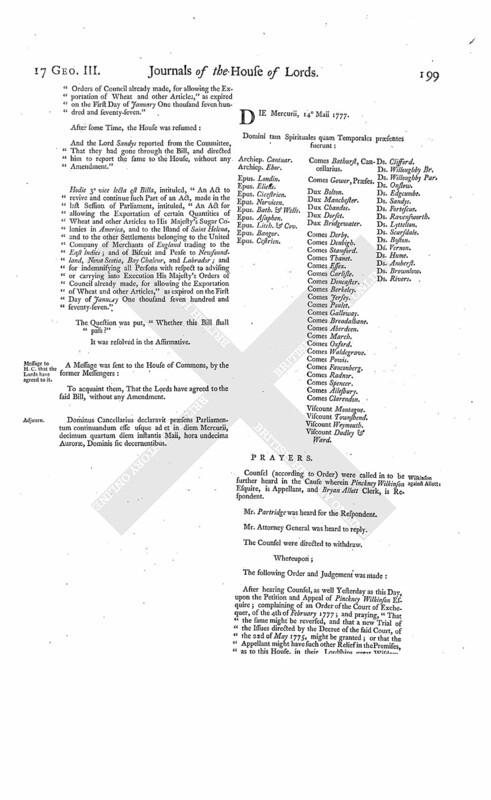 Ordered, That the Petition of divers Owners and Occupiers of Lands in the Parish of Maisemore, in the County of Gloucester; and also the Petition of the Gentlemen, Clergy, Tradesmen, and principal Inhabitants of the City of Gloucester, severally praying, "to be heard by themselves or Counsel, against such Parts of the said Bill as may be injurious to their respective Properties," be referred to the Committee of the whole House, to whom the said Bill stands committed, with Liberty for the Petitioners to be heard by their Counsel against the said Bill before the said Committee; and that Counsel be heard for the said Bill, at the same Time, if they think fit. 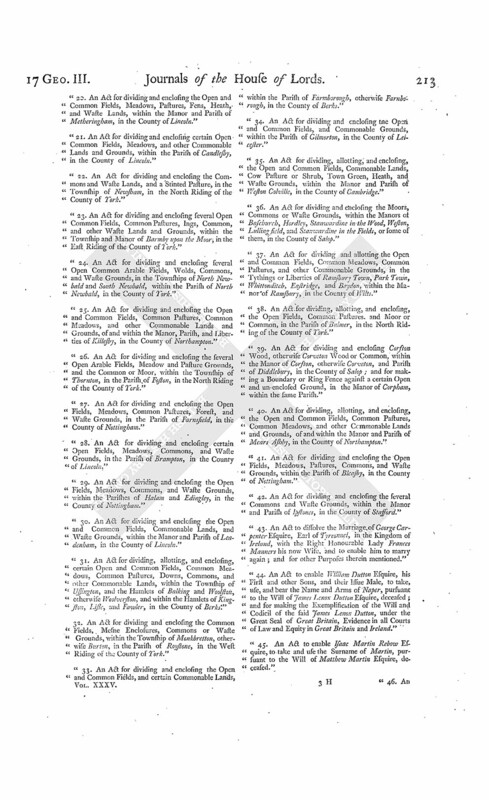 Hat Manufactory Bill, Petitions against. 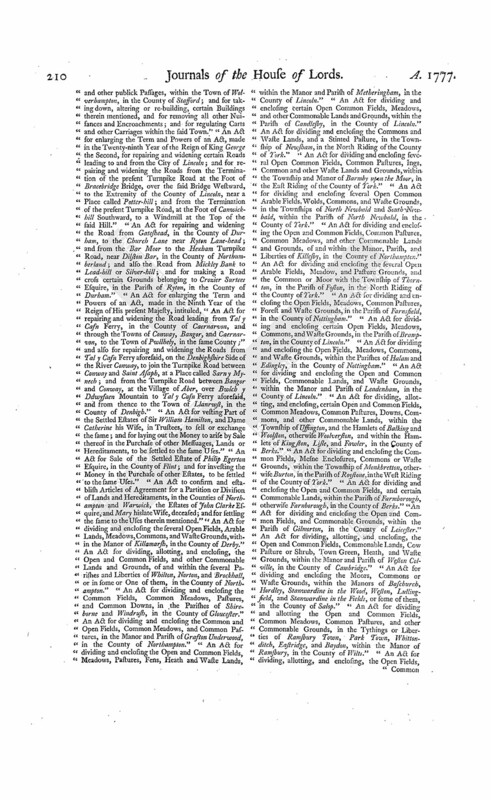 Upon reading the Petition of the Master Hat or Felt Manufacturers of the Town and Neighbourhood of Manchester, Bury, Rochdale, Oldham, Ashton Underline, Burnley, and Coln, all in the County of Lancaster, and also of Stockport, in the County of Chester, whose Names are thereunto subscribed, taking Notice of a Bill depending in this House, intituled, "An Act for the better regulating the Hat Manufactory;" and praying, "That their Lordships will not suffer those ancient Statutes of the Eighth of Elizabeth and the First of James the First to be repealed, and to grant the Petitioners such further and other Relief in the Premises, as to their Lordships shall seem meet:"
Upon reading the Petition of the several Master Hatmakers, resident in and about the City of London, and Borough of Southwark, whose Names are thereunto subscribed, taking Notice of a Bill depending in this House, intituled, "An Act for the better regulating the Hat Manufactory;" and praying, "That the said Bill may not pass into a Law, and that their Lordships will grant the Petitioners such Relief therein, as to their Lordships shall seem meet:"
Ordered, That the House be put into a Committee upon the said Bill To-morrow; and that Counsel be then heard for and against the same. Ordered, That the said Bill be read a Second Time on Friday next; and that Counsel be then heard for and against the same. The House (according to Order), was adjourned during Pleasure, and put into a Committee upon the Bill, intituled, "An Act for amending and rendering more effectual Two Acts of Parliament, One made in the Eighth Year of the Reign of His late Majesty, and the other in the Seventh Year of the Reign of His present Majesty, for Encouragement of the Arts of designing, engraving, and etching, Historical and other Prints; and for making further Provision to secure the Property of Prints, to the Inventors and Engravers thereof." And the Lord Scarsdale reported from the Committee, That they had gone through the Bill, and made several Amendments thereto, which he was ready to report when the House will please to receive the same." Life Annuities, registering Grants of, &c., Bill. Teatoreland, allowing Drawback on Bill. The House (according to Order), was adjourned during Pleasure, and put into a Committee upon the Bill, intituled, "An Act for allowing a Drawback of the Duties of Customs on the Exportation of Tea to Ireland." And the Lord Scarsdale reported from the Committee, "That they had gone through the Bill, and directed him to report the same to the House, without any Amendment." Tea, to prevent manufacturing Ash, &c. in Imitation of, Bill. 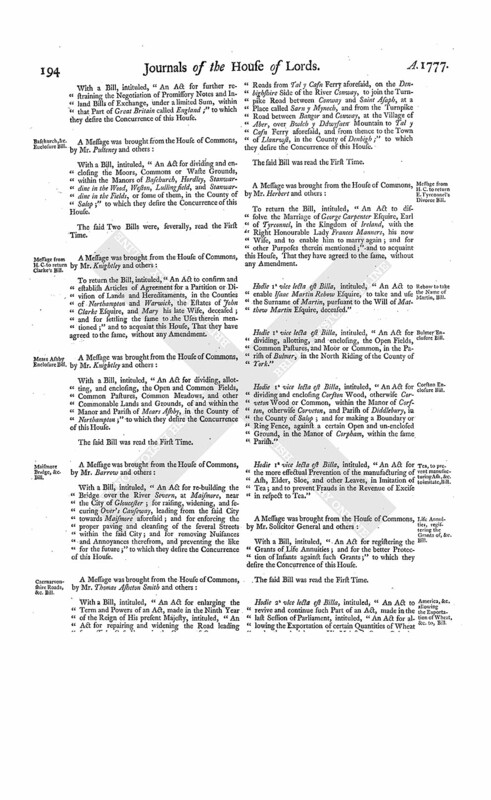 The House (according to Order), was adjourned during Pleasure, and put into a Committee upon the Bill, intituled, "An Act for the more effectual Prevention of the manufacturing of Ash, Elder, Sloe, and other Leaves, in Imitation of Tea; and to prevent Frauds in the Revenue of Excise in respect to Tea." Promissory Notes, &c. restraining Negotiation of, Bill. The House (according to Order) was adjourned during Pleasure, and put into a Committee upon the Bill, intituled, "An Act for further restraining the Negotiation of Promissory Notes, and Inland Bills of Exchange, under a limited Sum, within that Part of Great Britain called England." Hodie 3a vice lecta est Billa, intituled, "An Act for registering the Grants of Life Annuities; and for the better Protection of Infants against such Grants." Hodie 3a vice lecta est Billa, intituled, "An Act for allowing a Drawback of the Duties of Customs on the Exportation of Tea to Ireland." Hodie 3a vice lecta est Billa, intituled, "An Act for the more effectual Prevention of the manufacturing of Ash, Elder, Sloe, and other Leaves, in Imitation of Tea; and to prevent Frauds in the Revenue of Excise in respect to Tea." Hodie 3a vice lecta est Billa, intituled, "An Act for further restraining the Negotiation of Promissory Notes, and Inland Bills of Exchange, under a limited Sum, within that Part of Great Britain called England." Hodie 2a vice lecta est Billa, intituled, "An Act for dividing and enclosing the several Commons and Waste Grounds, within the Manor and Parish of Ipstones, in the County of Stafford." L. Bp. Bath. & Wells. Hodie 2a vice lecta est Billa, intituled, "An Act for dividing and enclosing the Common Fields, Common Meadows, Stinted Pasture, and Commonable Lands, within the Parish of Earl Stoke, in the County of Wilts." Dominus Cancellarius declaravit præsens Parliamentum continuandum esse usque ad et in diem Jovis, decimum quintum diem instantis Maii, hora undecima Auroræ, Dominis sic decernentibus. Epus. Bangor. Comes Bathurst, Cancellarius. Grahames against Heard et Ux. in Error. The Earl of Mansfield, Lord Chief Justice of the Court of King's Bench, in the usual Manner, delivered in at the Table a Writ of Error, wherein Benjamin Grahame and William Grahame are Plaintiffs, and Joseph Heard Esquire, and Katherine his Wife, are Defendants. The Lord Scarsdale reported from the Lords Committees to whom the Bill, intituled, "An Act for dividing and enclosing the several Commons and Waste Grounds, within the Manor and Parish of Ipstones, in the County of Stafford," was committed: "That they had considered the said Bill, and examined the Allegations thereof, which were found to be true; that the Parties concerned had given their Consents to the Satisfaction of the Committee; and that the Committee had gone through the Bill, and directed him to report the same to the House, without any Amendment." Hodie 3a vice lecta est Billa, intituled, "An Act for dividing and enclosing the several Commons and Waste Grounds, within the Manor and Parish of Ipstones, in the County of Stafford." The Lord Scarsdale reported from the Lords Committees, to whom the Bill, intituled, "An Act for dividing and enclosing the Common Fields, Common Meadows, Stinted Pasture, and Commonable Lands, within the Parish of Earl Stoke, in the County of Wilts," was committed: "That they had considered the said Bill, and examined the Allegations thereof, which were found to be true; that the Parties concerned had given their Consents to the Satisfaction of the Committee; and that the Committee had gone through the Bill, and made One Amendment thereto." Pr. 6. L. 15. After the Word ["Seven"] insert ["or as soon after as conveniently may be"]. The Lord Scarsdale (according to Order) reported the Amendments, made by the Committee of the whole House, to the Bill, intituled, "An Act for amending and rendering more effectual Two Acts of Parliament, One made in the Eighth Year of the Reign of His late Majesty, and the other in the Seventh Year of the Reign of His present Majesty, for Encouragement of the Arts of designing, engraving, and etching, Historical and other Prints; and for making further Provision to secure the Property of Prints to the Inventors and Engravers thereof." Pr. 3. L. 8. Leave out from the Word ["Britain"] to the Word ["then"], in the 15th Line of the same Press. L. 36. Leave out ["Five"] and insert ["Two"]; and in the same Line, after ["Shillings"] insert ["and Sixpence"]. L. 37. Leave out ["One"] and insert ["Two"]. Pr. 4. L. 4. Leave out ["Two"] and insert ["Three"]. L. 10. Leave out ["Three"] and insert ["Four"]. Pr. 5. L. 32. Leave out from the Word ["thereto"] to the Word ["then"], in the 39th Line of the same Press. Pr. 6. L. 7. Leave out ["Three"] and insert ["Four"]. And the said Amendments, being read a Second Time, were severally agreed to by the House. Maisemore Bridge, &c. Bill: Proper Officers to attend Committee, with the Charter of the City of Gloucester, &c.
Ordered, That the proper Officer do attend the Committee of the whole House, appointed to consider of the Bill, intituled, "An Act for re-building the Bridge over the River Severn at Maisemore, near the City of Gloucester; for raising, widening, and securing Over's Causeway, leading from the said City towards Maisemore aforesaid; and for enforcing the proper paving and cleansing of the several Streets within the said City and for removing Nuisances and Annoyances therefrom, and preventing the like for the Future," on the Second Day of Meeting after the Recess, with the Charter of the City of Gloucester, granted by Charles the Second, and the several other Charters referred to therein. Ordered, That the proper Officer do attend the Committee of the whole House, appointed to consider of the Bill, intituled, "An Act for re-building the Bridge over the River Severn at Maisemore, near the City of Gloucester; for raising, widening, and securing Over's Causeway, leading from the said City towards Maisemore aforesaid; and for enforcing the proper paving and cleansing of the several Streets within the said City and for removing Nuisances and Annoyances therefrom, and preventing the like for the future," on the Second Day of Meeting after the Recess, with the Indenture Tripartite of the 11th January, 31st Henry VIII. between Dame Johan Coke Widow, the Mayor and Burgesses of Gloucester, and the Bailiff and Citizens of Worccster. Ordered, That the proper Officer do attend the Committee of the whole House, appointed to consider of the Bill, intituled, "An Act for re-building the Bridge over the River Severn at Maisemore, near the City of Gloucester; for raising, widening, and securing, Over's Causeway, leading from the said City towards Maisemore aforesaid; and for enforcing the proper paving and cleansing of the several Streets within the said City, and for removing Nuisances and Annoyances therefrom, and preventing the like for the future," on the Second Day of Meeting after the Recess, with the Accounts of the Applications of the Rents of the Estates granted by the Indenture Tripartite of the 11th of January, 31st Henry VIII. between Dame Johan Coke Widow, the Mayor and Burgesses of Gloucester, and the Bailiff and Citizens of Worccster, for publick Uses; and particularly of the Rents of the several Estates at Stourhouse, Ebley, Oxlinch, Standish, Westbury, and Chaxhill, in the County of Gloucester, directed to be employed and yearly bestowed on Westbridge and Causeway, with the Five Pounds per Annum out of the Surplus of the Manor and other Premises therein mentioned; and also the Applications of the Tolls granted by their said Charter for the same Purpose (inter alia). Ordered, That Gabriel Harris Esquire, Treasurer of the Corporation of Gloucester, do attend the Committee of the whole House, appointed to consider of the Bill, intituled, "An Act for re-building the Bridge over the River Severn at Maisemore, near the City of Gloucester; for raising, widening, and securing Over's Causeway, leading from the said City towards Maisemore aforesaid; and for enforcing the proper paving and cleansing of the several Streets within the said City, and for removing Nuisances and Annoyances therefrom, and preventing the like for the future," on the Second Day of Meeting after the Recess, with his Accounts of the Rents of the several Estates of Stourhouse, Ebley, Oxlinch, Standish, Westbury, and Chaxhill, in the County of Gloucester, who the same are now let to respectively, and what are the present improved yearly Rents thereof. Hodie 2a vice lecta est Billa, intituled, "An Act for varying and enlarging the Powers of an Act, made in the Twelfth Year of the Reign of His present Majesty, for making a Navigable Cut or Canal from the River Dee, within the Liberties of the City of Chester, to or near Middlewich and Nantwich, in the County of Chester." V. Dudley & Ward. L. Bp. Bangor. L. Le Despencer. Their Lordships, or any Five of them, to meet on Tuesday, the 27th Day of this Instant May, at Ten o'Clock in the Forenoon, in the Prince's Lodgings, near the House of Peers; and to adjourn as they please. 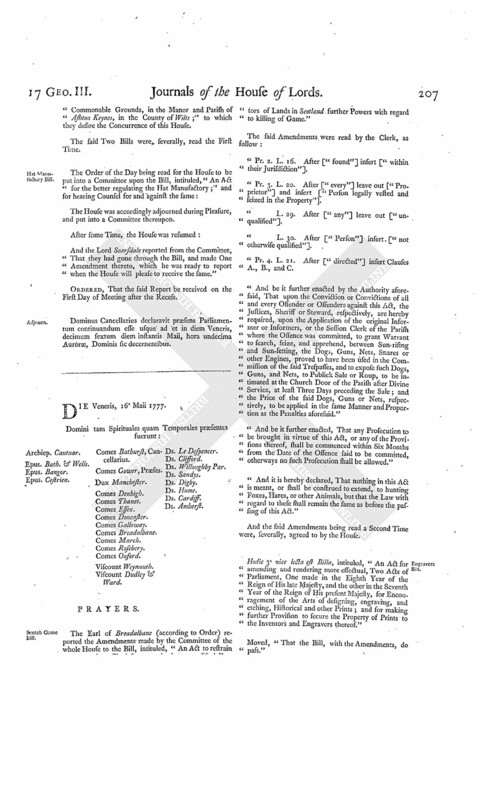 Upon reading the Petition of the Company of Proprietors of the Undertaking for recovering and preserving the Navigation of the River Dee, taking Notice of the last-mentioned Bill; and praying their Lordships, That they may be heard by Counsel against such Part of the said Bill as is contrary to their Agreement, and injurious to the Petitioners, by restraining Vessels larger than Fourteen Feet in Width, from navigating on, and using such Part of the said Canal, as goes through the Land or Ground belonging to the Petitioners; and that they may be otherwise relieved in the Premises, as to their Lordships, in their great Wisdom, shall seem meet:"
It is Ordered, That the said Petition be referred to the Committee to whom the said Bill stands committed, with Liberty for the Petitioners to be heard by their Counsel against the said Bill before the said Committee; and that Counsel be heard for the said Bill at the same Time, if they think fit. Hodie 2a vice lecta est Billa, intituled, "An Act for the better Relief and Employment of the Poor of the Parish of Saint Mary Abbotts Kensington, in the County of Middlesex; and for other Purposes therein mentioned." Hodie 2a vice lecta est Billa, intituled, "An Act to explain and amend an Act, made in the Fourteenth Year of the Reign of His present Majesty, intituled, An Act for paving, repairing, lighting, and watching, the Streets, and other publick Passages and Places, within that Part of the Parish of Clerkenwell called Saint James's, and removing Obstructions and Annoyances therein; for widening the Passage from Clerkenwell Green to the Parish Church; and for watching and lighting certain Highways within the said Parish;" for repairing the Highways in the said Parish, and cleansing the said Part of the said Parish; for widening the Passage from Clerkenwell Close to Rosoman's Street, and from Rosoman's Street to Saint John Street; and for building a Chapel in the said Parish." With a Bill, intituled, "An Act for dividing, allotting, and enclosing, several Commons, Moors or Waste Grounds, and Open Common Fields, in the Township of Barnsley, within the Parish of Silkston, in the County of York;" to which they desire the Concurrence of this House. Message from H. C. to return Sir W. Hamilton's Estate Bill. To return the Bill, intituled, "An Act for vesting Part of the Settled Estates of Sir William Hamilton, and Dame Catherine his Wife, in Trustees, to sell or exchange the same; and for laying out the Money to arise by Sale thereof, in the Purchase of other Messuages, Lands or Hereditaments, to be settled to the same Uses;" and to acquaint this House, That they have agreed to the same, without any Amendment. With a Bill, intituled, "An Act to allow the Master Dyers, within the Counties of Middlesex, Essex, Surrey, and Kent, to employ Journeymen in their Trade who have not served Apprenticeships thereto;" to which they desire the Concurrence of this House. Foreign Wrought Silks, &c. to prohibit Importation of, &c. Bill. Hodie 2a vice lecta est Billa, intituled, "An Act for further continuing an Act, passed in the Sixth Year of His present Majesty's Reign, intituled, "An Act to prohibit the Importation of Foreign Wrought Silks and Velvets, for a limited Time; and for preventing unlawful Combinations of Workmen employed in the Silk Manufacture." Ordered, That the House be put into a Committee upon the said Bill, on Wednesday the 28th Day of this Instant May. The House (according to Order) was adjourned during Pleasure, and put into a Committee upon the Bill, intituled, "An Act to restrain Apprentices, Tradesmen, and other unqualified Persons, from destroying the Game in that Part of Great Britain called Scotland; and for granting to Proprietors of Lands in Scotland further Powers with regard to killing of Game." Constables and Witnesses Costs, &c. Bill. 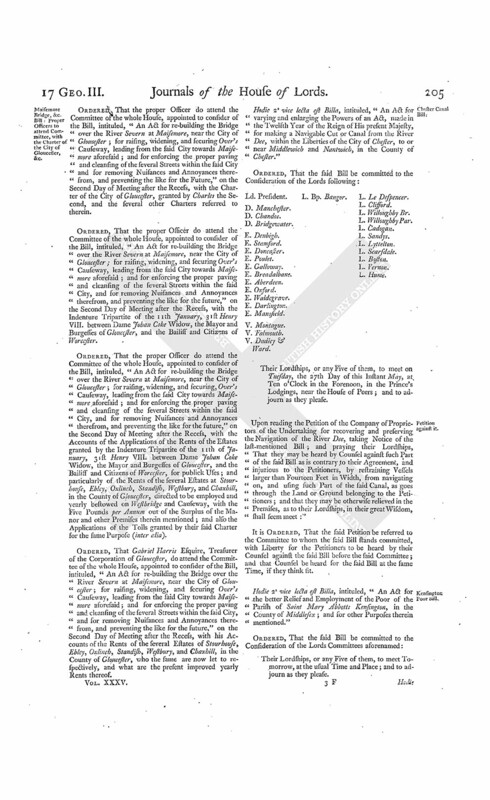 The Order of the Day being read for the House to be put into a Committee upon the Bill, intituled, "An Act for the Payment of Costs to Parties, and Charges to Constables, Witnesses, and others, on Complaints determined before Justices of the Peace out of Sessions; for the Payment of the Charges of Constables in certain Cases; and for the more effectual Payment of Charges to Witnesses, and Prosecutors of any Larceny or other Felony:"
Ordered, That the House be put into a Committee upon the said Bill, on Friday the 30th Day of this Instant May. Hodie 2a vice lecta est Billa, intituled, "An Act for the more easy and speedy Recovery of small Debts, within the several Parishes of Surfleet, Gosberton, Quadring, Donington, Bicker Swineshead, Wigtost, Sutterton, Algarkirk, Fosdike, Kirton, Frampton, Wiberton, and Brothertost, within the Hundred of Kirton, in the Parts of Holland, in the County of Lincoln." With a Bill, intituled, "An Act for establishing a Nightly Watch within the Hamlet of Mile End Old Town, in the Parish of Saint Dunstan Stepney, otherwise Stebonheath, in the County of Middlesex;" to which they desire the Concurrence of this House. With a Bill, intituled, "An Act for dividing, allotting, and enclosing, the Open and Common Fields, Common Meadows, Common Pastures, and other Commonable Grounds, in the Manor and Parish of Ashton Keynes, in the County of Wilts;" to which they desire the Concurrence of this House. The House was accordingly adjourned during Pleasure, and put into a Committee thereupon. And the Lord Scarsdale reported from the Committee, "That they had gone through the Bill, and made One Amendment thereto, which he was ready to report when the House will please to receive the same." Ordered, That the said Report be received on the First Day of Meeting after the Recess. Dominus Cancellarius declaravit præsens Parliamentum continuandum esse usque ad et in diem Veneris, decimum sextum diem instantis Maii, hora undecima Auroræ, Dominis sic decernentibus. The Earl of Breadalbane (according to Order) reported the Amendments made by the Committee of the whole House to the Bill, intituled, "An Act to restrain Apprentices, Tradesmen, and other unqualified Persons, from destroying the Game in that Part of Great Britain called Scotland; and for granting to Proprietors of Lands in Scotland further Powers with regard to killing of Game." Pr. 2. L. 16. After ["found"] insert ["within their Jurisdiction"]. Pr. 3. L. 20. After ["every"] leave out ["Proprietor"] and insert ["Person legally vested and seized in the Property"]. L. 29. After ["any"] leave out ["unqualified"]. L. 30. After ["Person"] insert ["not otherwise qualified"]. Pr. 4. L. 21. After ["directed"] insert Clauses A., B., and C.
"And be it further enacted by the Authority aforesaid, That upon the Conviction or Convictions of all and every Offender or Offenders against this Act, the Justices, Sheriff or Steward, respectively, are hereby required, upon the Application of the original Informer or Informers, or the Session Clerk of the Parish where the Offence was committed, to grant Warrant to search, seize, and apprehend, between Sun-rising and Sun-setting, the Dogs, Guns, Nets, Snares or other Engines, proved to have been used in the Commission of the said Trespasses, and to expose such Dogs, Guns, and Nets, to Publick Sale or Roup, to be intimated at the Church Door of the Parish after Divine Service, at least Three Days preceding the Sale; and the Price of the said Dogs, Guns or Nets, respectively, to be applied in the same Manner and Proportion as the Penalties aforesaid." "And be it further enacted, That any Prosecution to be brought in virtue of this Act, or any of the Provisions thereof, shall be commenced within Six Months from the Date of the Offence said to be committed, otherways no such Prosecution shall be allowed." "And it is hereby declared, That nothing in this Act is meant, or shall be construed to extend, to hunting Foxes, Hares, or other Animals, but that the Law with regard to these shall remain the same as before the passing of this Act." And the said Amendments being read a Second Time were, severally, agreed to by the House. Hodie 3a vice lecta est Billa, intituled, "An Act for amending and rendering more effectual, Two Acts of Parliament, One made in the Eighth Year of the Reign of His late Majesty, and the other in the Seventh Year of the Reign of His present Majesty, for Encouragement of the Arts of designing, engraving, and etching, Historical and other Prints; and for making further Provision to secure the Property of Prints to the Inventors and Engravers thereof." Moved, "That the Bill, with the Amendments, do pass." The Earl of Rosebery reported from the Lords Committees, to whom the Bill, intituled, "An Act to explain and amend an Act, made in the Fourteenth Year of the Reign of His present Majesty, intituled, "An Act for paving, repairing, lighting, and watching, the Streets, and other publick Passages and Places, within that Part of the Parish of Clerkenwell called Saint James's, and removing Obstructions and Annoyances therein; for widening the Passage from Clerkenwell Green to the Parish Church; and for watching and lighting certain Highways within the said Parish;" for repairing the Highways in the said Parish, and cleansing the said Part of the said Parish; for widening the Passage from Clerkenwell Close to Rosoman's Street, and from Rosoman's Street to Saint John Street; and for building a Chapel in the said Parish," was committed: "That they had considered the said Bill, and examined the Allegations thereof, which were found to be true; and that the Committee had gone through the Bill, and directed him to report the same to the House, without any Amendment." The Earl of Rosebery made the like Report from the Lords Committees, to whom the Bill, intituled, "An Act for the better Relief and Employment of the Poor of the Parish of Saint Mary Abbotts Kensington, in the County of Middlesex; and for other Purposes therein mentioned," was committed. The Earl of Rosebery also made the like Report from the Lords Committees, to whom the Bill, intituled, "An Act for the more easy and speedy Recovery of small Debts, within the several Parishes of Sursleet, Gosberton, Quadring, Donington, Bicker, Swineshead, Wigtost, Sutterton, Algarkirk, Fosdike, Kirton, Frampton, Wiberton, and Brothertoft, within the Hundred of Kirton, in the Parts of Holland, in the County of Lincoln," was committed. Seamen, for the better Supply of, Bill. With a Bill, intituled, "An Act for the better Supply of Mariners and Seamen to serve in His Majesty's Ships of War, and on board Merchant Ships, and other Trading Ships and Vessels;" to which they desire the Concurrence of this House. Hodie 3a vice lecta est Billa, intituled, "An Act for the better Relief and Employment of the Poor of the Parish of Saint Mary Abbotts Kensington, in the County of Middlesex; and for other Purposes therein mentioned." Hodie 3a vice lecta est Billa, intituled, "An Act for the more easy and speedy Recovery of small Debts, within the several Parishes of Sursleet, Gosberton, Quadring, Donington, Bicker, Swineshead, Wigtoft, Sutterton, Algarkirk, Fosdike, Kirton, Frampton, Wiberton, and Brothertoft, within the Hundred of Kirton, in the Parts of Holland, in the County of Lincoln." Hodie 3a vice lecta est Billa, intituled, "An Act to explain and amend an Act, made in the Fourteenth Year of the Reign of His present Majesty, intituled, An Act for paving, repairing, lighting, and watching, the Streets, and other publick Passages and Places, within that Part of the Parish of Clerkenwell called Saint James's, and removing Obstructions and Annoyances therein; for widening the Passage from Clerkenwell Green to the Parish Church; and for watching and lighting certain Highways within the said Parish;" for repairing the Highways in the said Parish, and cleansing the said Part of the said Parish; for widening the Passage from Clerkenwell Close to Rosoman's Street, and from Rosoman's Street to Saint John Street; and for building a Chapel in the said Parish." Hodie 3a vice lecta est Billa, intituled, "An Act for dividing and enclosing the Common Fields, Common Meadows, Stinted Pasture, and Commonable Lands, within the Parish of Earl Stoke, in the County of Wilts." To return the said Bill, and acquaint them, That the Lords have agreed to the same, with One Amendment, to which their Lordships desire their Concurrence. 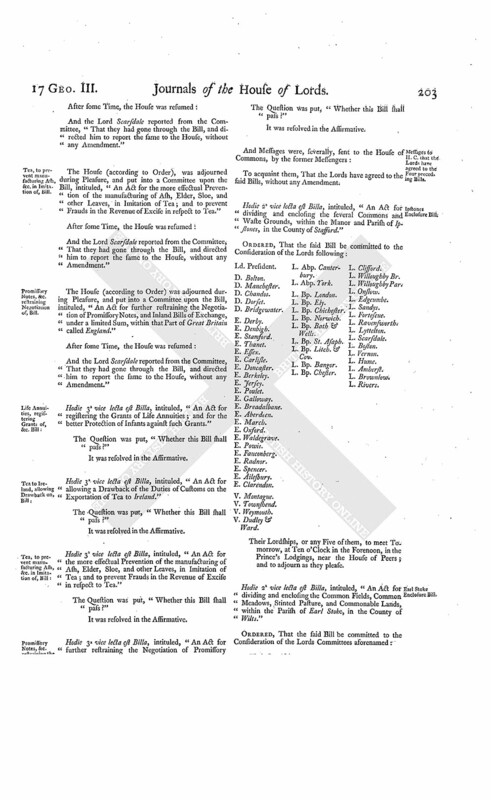 Hodie 2a vice lecta est Billa, intituled, "An Act for dividing, allotting, and enclosing, several Commons, Moors or Waste Grounds, and Open Common Fields, in the Township of Barnsley, within the Parish of Silkston, in the County of York." L. Bp. Chester. L. Le Despencer. Their Lordships, or any Five of them, to meet on the First Day of Meeting after the Recess, at Ten o'Clock in the Forenoon, in the Prince's Lodgings, near the House of Peers; and to adjourn as they please. Hodie 2a vice lecta est Billa, intituled, "An Act to allow the Master Dyers, within the Counties of Middlesex, Essex, Surrey, and Kent, to employ Journeymen in their Trade who have not served Apprenticeships thereto." Ordered, That the House be put into a Committee upon the said Bill on the First Day of Meeting after the Recess. Then Three of the Lords Commissioners, being in their Robes, and seated on a Form placed between the Throne and the Woolsack, the Lord Chancellor in the Middle, with the Archbishop of Canterbury on his Right Hand, and the Lord President on his Left; commanded the Gentleman Usher of the Black Rod to signify to the Commons, "The Lords Commissioners desire their immediate Attendance in this House, to hear the Commission read." His Majesty not thinking sit to be personally present here at this Time, has been pleased to cause a Commission to be issued under the Great Seal, and thereby given His Royal Assent to divers Acts, which have been agreed upon by both Houses of Parliament, the Titles whereof are particularly mentioned; and by the said Commission hath commanded us to declare and notify His Royal Assent to the said several Acts, in the Presence of you the Lords and Commons, assembled for that Purpose; which Commission you will now hear read." George the Third, by the Grace of God, of Great Britain, France, and Ireland, King, Desender of the Faith, and so forth; To Our Right Trusty and Right Well-beloved the Lords Spiritual and Temporal, and to Our Trusty and Well-beloved the Knights, Citizens, and Burgesses, and the Commissioners for Shires and Burghs, of the House of Commons, in this present Parliament assembled, Greeting. Whereas We have seen and perfectly understood divers and sundry Acts agreed and accorded on by you Our loving Subjects the Lords Spiritual and Temporal, and the Commons, in this Our present Parliament assembled, and endorsed by you as hath been accustomed, the Titles and Names of which Acts hereafter do particularly ensue; (that is to say), "An Act to revive and continue such Part of an Act, made in the last Session of Parliament, intituled, "An Act for allowing the Exportation of certain Quantities of Wheat and other Articles to His Majesty's Sugar Colonies in America, and to the Island of Saint Helena, and to the other Settlements belonging to the United Company of Merchants of England trading to the East Indies; and of Biscuit and Pease to Newfoundland, Nova Scotia, Bay Chaleur, and Labrador; and for indemnifying all Persons with respect to advising or carrying into Execution His Majesty's Orders of Council already made, for allowing the Exportation of Wheat and other Articles," as expired on the First Day of January One thousand seven hundred and seventy-seven." "An Act for registering the Grants of Life Annuities; and for the better Protection of Infants against such Grants." "An Act for allowing a Drawback of the Duties of Customs on the Exportation of Tea to Ireland." "An Act for the more effectual Prevention of the manufacturing of Ash, Elder, Sloe, and other Leaves in Imitation of Tea; and to prevent Frauds in the Revenue of Excise in respect to Tea." "An Act for further restraining the Negotiation of Promissory Notes and Inland Bills of Exchange, under a limited Sum, within that Part of Great Britain called England." "An Act to enable the Dean and Chapter of the Collegiate Church of Saint Peter in Westminster, to open a Street from the South End of Long Ditch to the North End of Smith Street, and to widen Part of Tothill Street and of Long Ditch aforesaid; and to widen the Passage between Orchard Street and the new intended Street; and also to widen Wood Street, and to make a more commodious Entrance from the Broad Sanctuary into Dean's Yard, within the City and Liberty of Westminster." "An Act to enable the Commissioners for executing the Office of Treasurer of His Majesty's Exchequer, or the Lord High Treasurer for the Time being, to make an Agreement or Composition with the several Sureties of William Brown, and the Representatives of such of the said Sureties as are dead, for a Debt remaining due from them to the Crown on several Tobacco Bonds entered into and executed by such Sureties respectively; and that they, and their Estates and Effects, may be acquitted and discharged therefrom." An Act for enclosing and embellishing the Middle Part of Hoxton Square, in the Parish of Saint Leonard Shoreditch, in the County of Middlesex; and for extinguishing all Right of Common in and upon the said Square." "An Act for widening, cleansing, and lighting, the several Streets, Lanes, Alleys, Ways, and other publick Passages, within the Town of Wolverhampton, in the County of Stafford; and for taking down, altering or re-building, certain Buildings therein mentioned, and for removing all other Nuisances and Encroachments; and for regulating Carts and other Carriages within the said Town." "An Act for enlarging the Term and Powers of an Act, made in the Twenty-ninth Year of the Reign of King George the Second, for repairing and widening certain Roads leading to and from the City of Lincoln; and for repairing and widening the Roads from the Termination of the present Turnpike Road at the Foot of Bracebridge Bridge, over the said Bridge Westward, to the Extremity of the County of Lincoln, near a Place called Potter-hill; and from the Termination of the present Turnpike Road, at the Foot of Canwickhill Southward, to a Windmill at the Top of the said Hill." "An Act for repairing and widening the Road from Gateshead, in the County of Durham, to the Church Lane near Ryton Lane-head; and from the Bar Moor to the Hexham Turnpike Road, near Dilston Bar, in the County of Northumberland; and also the Road from Mickley Bank to Lead-hill or Silver-hill; and for making a Road cross certain Grounds belonging to Crozier Surtees Esquire, in the Parish of Ryton, in the County of Durham." "An Act for enlarging the Term and Powers of an Act, made in the Ninth Year of the Reign of His present Majesty, intituled, "An Act for repairing and widening the Road leading from Tal y Cafn Ferry, in the County of Caernarvon, and through the Towns of Conway, Bangor, and Caernarvon, to the Town of Pwllhely, in the same County;" and also for repairing and widening the Roads from Tal y Cafn Ferry aforesaid, on the Denbighshire Side of the River Conway, to join the Turnpike Road between Conway and Saint Asaph, at a Place called Sarny Mynech; and from the Turnpike Road between Bangor and Conway, at the Village of Aber, over Bwlch y Ddwyfaen Mountain to Tal y Cafn Ferry aforesaid, and from thence to the Town of Llanrwst, in the County of Denbigh." "An Act for vesting Part of the Settled Estates of Sir William Hamilton, and Dame Catherine his Wife, in Trustees, to sell or exchange the same; and for laying out the Money to arise by Sale thereof in the Purchase of other Messuages, Lands or Hereditaments, to be settled to the same Uses." "An Act for Sale of the Settled Estate of Philip Egerton Esquire, in the County of Flint; and for investing the Money in the Purchase of other Estates, to be settled to the same Uses." "An Act to confirm and establish Articles of Agreement for a Partition or Division of Lands and Hereditaments, in the Counties of Northampton and Warwick, the Estates of John Clarke Esquire, and Mary hislate Wife, deceased; and for settling the same to the Uses therein mentioned." "An Act for dividing and enclosing the several Open Fields, Arable Lands, Meadows, Commons, and Waste Grounds, within the Manor of Killamarsh, in the County of Derby." An Act for dividing, allotting, and enclosing, the Open and Common Fields, and other Commonable Lands and Grounds, of and within the several Parishes and Liberties of Whilton, Norton, and Brockhall, or in some or One of them, in the County of Northampton." "An Act for dividing and enclosing the Common Fields, Common Meadows, Pastures, and Common Downs, in the Parishes of Shireborne and Windrush, in the County of Gloucester." An Act for dividing and enclosing the Common and Open Fields, Common Meadows, and Common Pastures, in the Manor and Parish of Grafton Underwood, in the County of Northampton." "An Act for dividing and enclosing the Open and Common Fields, Meadows, Pastures, Fens, Heath and Waste Lands, within the Manor and Parish of Metheringham, in the County of Lincoln." "An Act for dividing and enclosing certain Open Common Fields, Meadows, and other Commonable Lands and Grounds, within the Parish of Candlesby, in the County of Lincoln." An Act for dividing and enclosing the Commons and Waste Lands, and a Stinted Pasture, in the Township of Newsham, in the North Riding of the County of York." "An Act for dividing and enclosing several Open Common Fields, Common Pastures, Ings, Common and other Waste Lands and Grounds, within the Township and Manor of Barmby upon the Moor, in the East Riding of the County of York." "An Act for dividing and enclosing several Open Common Arable Fields, Wolds, Commons, and Waste Grounds, in the Townships of North Newbald and South Newbald, within the Parish of North Newbald, in the County of York." "An Act for dividing and enclosing the Open and Common Fields, Common Pastures, Common Meadows, and other Commonable Lands and Grounds, of and within the Manor, Parish, and Liberties of Killesby, in the County of Northampton." An Act for dividing and enclosing the several Open Arable Fields, Meadow, and Pasture Grounds, and the Common or Moor with the Township of Thornton, in the Parish of Foston, in the North Riding of the County of York." "An Act for dividing and enclosing the Open Fields, Meadows, Common Pastures, Forest and Waste Grounds, in the Parish of Farnsfield, in the County of Nottingham." "An Act for dividing and enclosing certain Open Fields, Meadows, Commons, and Waste Grounds, in the Parish of Brampton, in the County of Lincoln." "An Act for dividing and enclosing the Open Fields, Meadows, Commons, and Waste Grounds, within the Parishes of Halam and Edingley, in the County of Nottingham." "An Act for dividing and enclosing the Open and Common Fields, Commonable Lands, and Waste Grounds, within the Manor and Parish of Leadenham, in the County of Lincoln." "An Act for dividing, allotting, and enclosing, certain Open and Common Fields, Common Meadows, Common Pastures, Downs, Commons, and other Commonable Lands, within the Township of Ussington, and the Hamlets of Balking and Woolston, otherwise Woolverston, and within the Hamlets of Kingston, Lisle, and Fawler, in the County of Berks." "An Act for dividing and enclosing the Common Fields, Mesne Enclosures, Commons or Waste Grounds, within the Township of Monkbretton, otherwise Burton, in the Parish of Roystone, in the West Riding of the County of York." "An Act for dividing and enclosing the Open and Common Fields, and certain Commonable Lands, within the Parish of Farmborough, otherwise Farnborough, in the County of Berks." "An Act for dividing and enclosing the Open and Common Fields, and Commonable Grounds, within the Parish of Gilmorton, in the County of Leicester." An Act for dividing, allotting, and enclosing, the Open and Common Fields, Commonable Lands, Cow Pasture or Shrub, Town Green, Heath, and Waste Grounds, within the Manor and Parish of Weston Colville, in the County of Cambridge." "An Act for dividing and enclosing the Moors, Commons or Waste Grounds, within the Manors of Baschurch, Hordley, Stanwardine in the Wood, Weston, Lullingfield, and Stanwardine in the Fields, or some of them, in the County of Salop." "An Act for dividing and allotting the Open and Common Fields, Common Meadows, Common Pastures, and other Commonable Grounds, in the Tythings or Liberties of Ramsbury Town, Park Town, Whittonditch, Eastridge, and Baydon, within the Manor of Ramsbury, in the County of Wilts." "An Act for dividing, allotting, and enclosing, the Open Fields, Common Pastures, and Moor or Common, in the Parish of Bulmer, in the North Riding of the County of York." "An Act for dividing and enclosing Corfton Wood, otherwise Corveton Wood or Common, within the Manor of Corfton, otherwise Corveton, and Parish of Diddlebury, in the County of Salop; and for making a Boundary or Ring Fence against a certain Open and un-enclosed Ground, in the Manor of Corpham, within the same Parish." " An Act for dividing, allotting, and enclosing, the Open and Common Fields, Common Pastures, Common Meadows, and other Commonable Lands and Grounds, of and within the Manor and Parish of Mears Ashby, in the County of Northampton." "An Act for dividing and enclosing the Open Fields, Meadows, Pastures, Commons, and Waste Grounds, within the Parish of Bleasby, in the County of Nottingham." An Act for dividing and enclosing the several Commons and Waste Grounds, within the Manor and Parish of Ipstones, in the County of Stafford." "An Act to dissolve the Marriage of George Carpenter Esquire, Earl of Tyrconnel in the Kingdom of Ireland, with the Right Honourable Lady Frances Manners, his now Wife, and to enable him to marry again; and for other Purposes therein mentioned." "An Act to enable William Dutton Esquire, his First and other Sons, and their Issue Male, to take, use, and bear the Name and Arms of Naper, pursuant to the Will of James Lenox Dutton Esquire, deceased; and for making the Exemplification of the Will and Codicil of the said James Lenox Dutton, under the Great Seal of Great Britain, Evidence in all Courts of Law and Equity in Great Britain and Ireland." "An Act to enable Isaac Martin Rebow Esquire, to take and use the Surname of Martin, pursuant to the Will of Matthew Martin Esquire, deceased." "An Act for naturalizing Maria Perry." "An Act for naturalizing Charles Morris Klanert." And albeit, the said Acts by you Our said Subjects, the Lords and Commons in this Our present Parliament assembled, are fully agreed and consented unto; yet, nevertheless, the same are not of Force and Effect in the Law, without Our Royal Assent given and put to the said Acts: And forasmuch as for divers Causes and Considerations, We cannot conveniently at this Time be present in Our Royal Person in the Higher House of Our said Parliament, being the Place accustomed to give Our Royal Assent to such Acts as have been agreed upon by you Our said Subjects the Lords and Commons, We have therefore caused these Our Letters Patent to be made, and have signed the same, and by the same do give and put Our Royal Assent to the said Acts, and to all Articles, Clauses, and Provisions therein contained, and have fully agreed and assented to the said Acts; Willing that the said Acts, and every Article, Clause, Sentence, and Provision therein contained, from henceforth shall be of the same Strength, Force, and Effect, as if We had been personally present in the said Higher House, and had openly and publickly in the Presence of you all assented to the same: And We do by these Presents declare and notify the same Our Royal Assent, as well to you the Lords Spiritual and Temporal, and Commons aforesaid, as to all others whom it may concern; commanding also by these Presents Our Right Trusty and Right Well-beloved Cousin and Counsellor Henry Earl Bathurst, Our Chancellor of Great Britain, to seal these Our Letters Patent with Our Great Seal of Great Britain; and also commanding the Most Reverend Father in God, Our Right Trusty and Well-beloved Counsellor Frederick Archbishop of Canterbury, Primate and Metropolitan of all England; Our said Chancellor of Great Britain; Our Right Trusty and Right Well-beloved Cousins and Counsellors, Granville Earl Gower, President of Our Council; William Earl of Dartmouth, Keeper of Our Privy Seal; Out Right Trusty and Right Entirely-beloved Cousins and Counsellors, Augustus Henry Duke of Grafton, Thomas Duke of Leeds, John Duke of Rutland, Peregrine Duke of Ancaster and Kesteven, Great Chamberlain of England; Our Right Trusty and Right Well-beloved Cousins and Counsellors, William Earl Talbot, Steward of Our Household; Francis Seymour Earl of Hertford, Chamberlain of Our Household; Henry Earl of Suffolk and Berkshire, One of Our Principal Secretaries of State; John Earl of Sandwich, First Commissioner of Our Admiralty; Robert Earl of Holdernesse, William Henry Earl of Rochford, Hugh Earl of Marchmont, John Earl of Ashburnham, Groom of Our Stole; Simon Earl Harcourt, Wills Earl of Hillsborough, William Earl of Mansfield, Our Chief Justice assigned to hold Pleas before Us; and Our Right Trusty and Well-beloved Cousins and Counsellors, George Viscount Townshend, and Thomas Viscount Weymouth, One other of Our Principal Secretaries of State; or any Three or more of them, to declare and notify this Our Royal Assent, in Our Absence in the said Higher House, in the Presence of you the said Lords and the Commons of Our Parliament there to be assembled for that Purpose; and the Clerk of Our Parliaments to endorse the said Acts, with such Terms and Words in Our Name as is requisite and hath been accustomed for the same, and also to enrol these Our Letters Patent and the said Acts in the Parliament Roll; and these Our Letters Patent shall be to every of them a sufficient Warrant in that Behalf. And finally We do declare and will that, after this Our Royal Assent given and passed by these Presents, and declared and notified as is aforesaid, then and immediately the said Acts shall be taken, accepted, and admitted good, sufficient, and perfect Acts of Parliament and Laws, to all Intents, Constructions, and Purposes, and to be put in due Execution accordingly; the Continuance or Dissolution of this Our Parliament, or any other Use, Custom, Thing or Things, to the contrary thereof notwithstanding. In Witness whereof, We have caused these Our Letters to be made Patent. Witness Ourself at Westminster, the Sixteenth Day of May, in the Seventeenth Year of Our Reign. 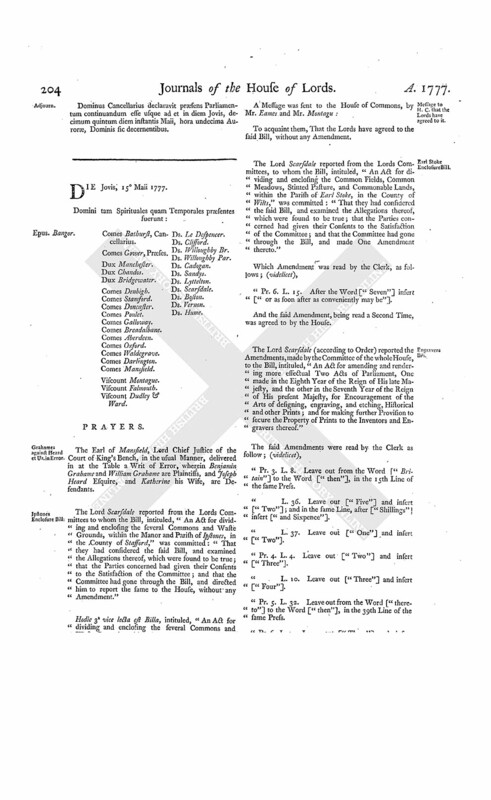 "In Obedience to His Majesty's Commands, and by virtue of the Commission which has been now read, we do declare and notify to you, the Lords Spiritual and Temporal, and Commons, in Parliament assembled, That His Majesty hath given His Royal Assent to the several Acts in the Commission mentioned, and the Clerks are required to pass the same in the usual Form and Words:"
"1. An Act to revive and continue such Part of an Act, made in the last Session of Parliament, intituled, An Act for allowing the Exportation of certain Quanties of Wheat and other Articles, to His Majesty's Sugar Colonies in America, and to the Island of Saint Helena, and to the other Settlements belonging to the United Company of Merchants of England trading to the East Indies; and of Biscuit and Pease to Newfoundland, Nova Scotia, Bay Chaleur, and Labrador; and for indemnifying all Persons with respect to advising or carrying into Execution His Majesty's Orders of Council already made, for allowing the Exportation of Wheat and other Articles," as expired on the First Day of January One thousand seven hundred and seventy-seven." "2. An Act for registering the Grants of Life Annuities; and for the better Protection of Infants against such Grants." "3. An Act for allowing a Drawback of the Duties of Customs on the Exportation of Tea to Ireland." "4. An Act for the more effectual Prevention of the manufacturing of Ash, Elder, Sloe, and other Leaves, in Imitation of Tea; and to prevent Frauds in the Revenue of Excise in respect to Tea." "5. An Act for further restraining the Negotiation of Promissory Notes, and Inland Bills of Exchange, under a limited Sum, within that Part of Great Britain called England." "6. 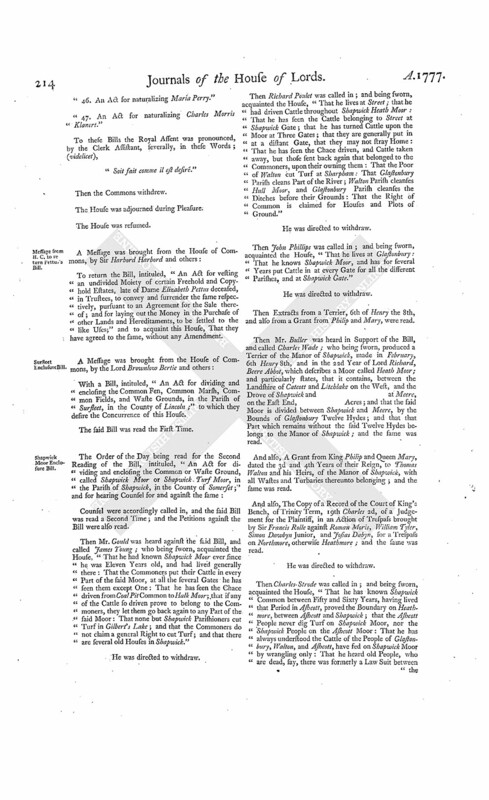 An Act to enable the Dean and Chapter of the Collegiate Church of Saint Peter in Westminster, to open a Street from the South End of Long Ditch to the North End of Smith Street, and to widen Part of Tothill Street and of Long Ditch aforesaid; and to widen the Passage between Orchard Street and the new intended Street; and also to widen Wood Street, and to make a more commodious Entrance from the Broad Sanctuary into Dean's Yard, within the City and Liberty of Westminster." "7. 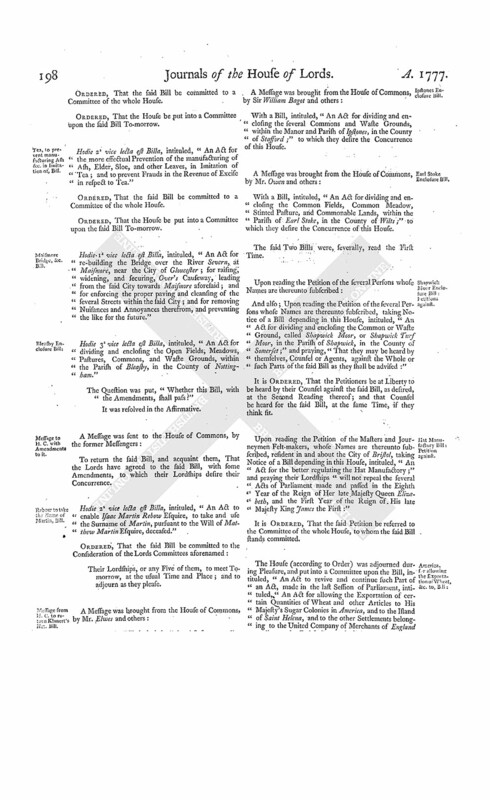 An Act to enable the Commissioners for executing the Office of Treasurer of His Majesty's Exchequer, or the Lord High Treasurer for the Time being, to make an Agreement or Composition with the several Sureties of William Brown, and the Representatives of such of the said Sureties as are dead, for a Debt remaining due from them to the Crown on several Tobacco Bonds, entered into and executed by such Sureties respectively; and that they, and their Estates and Effects, may be acquitted and discharged therefrom." "8. An Act for enclosing and embellishing the Middle Part of Hoxton Square, in the Parish of Saint Leonard Shoreditch, in the County of Middlesex; and for extinguishing all Right of Common in and upon the said Square." "9. An Act for widening, cleansing, and lighting, the several Streets, Lanes, Alleys, Ways, and other publick Passages, within the Town of Wolverhampton, in the County of Stafford; and for taking down, altering, or re-building, certain Buildings therein mentioned, and for removing all other Nuisances and Encroachments; and for regulating Carts and other Carriages within the said Town." "10. 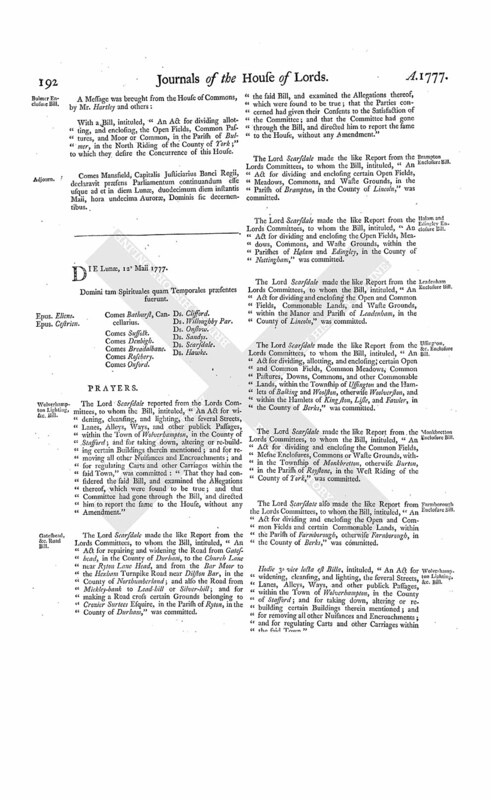 An Act for enlarging the Term and Powers of an Act, made in the Twenty-ninth Year of the Reign of King George the Second, for repairing and widening certain Roads leading to and from the City of Lincoln; and for repairing and widening the Roads from the Termination of the present Turnpike Road, at the Foot of Bracebridge Bridge, over the said Bridge Westward, to the Extremity of the County of Lincoln, near a Place called Potter-hill; and from the Termination of the present Turnpike Road, at the Foot of Canwick-hill Southward, to a Windmill at the Top of the said Hill." "11. An Act for repairing and widening the Road from Gateshead, in the County of Durham, to the Church Lane near Ryton Lane-head; and from the Bar Moor to the Hexham Turnpike Road, near Dilston Bar, in the County of Northumberland; and also the Road from Mickley Bank to Lead-hill or Silverhill; and for making a Road cross certain Grounds belonging to Crozier Surtees Esquire, in the Parish of Ryton, in the County, of Durham." "12. 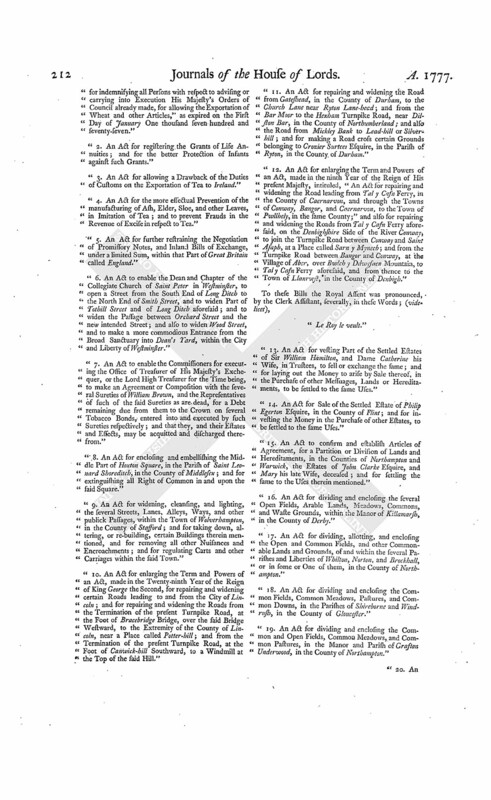 An Act for enlarging the Term and Powers of an Act, made in the ninth Year of the Reign of His present Majesty, intituled, "An Act for repairing and widening the Road leading from Tal y Cafn Ferry, in the County of Caernarvon, and through the Towns of Conway, Bangor, and Caernarvon, to the Town of Pwllhely, in the same County;" and also for repairing and widening the Roads from Tal y Cafn Ferry aforesaid, on the Denbighshire Side of the River Conway, to join the Turnpike Road between Conway and Saint Asaph, at a Place called Sarn y Mynech; and from the Turnpike Road between Bangor and Conway, at the Village of Aber, over Bwlch y Ddwyfaen Mountain, to Tal y Cafn Ferry aforesaid, and from thence to the Town of Llanrwst, in the County of Denbigh." "13. An Act for vesting Part of the Settled Estates of Sir William Hamilton, and Dame Catherine his Wife, in Trustees, to sell or exchange the same; and for laying out the Money to arise by Sale thereof, in the Purchase of other Messuages, Lands or Hereditaments, to be settled to the same Uses." "14. An Act for Sale of the Settled Estate of Philip Egerton Esquire, in the County of Flint; and for investing the Money in the Purchase of other Estates, to be settled to the same Uses." "15. An Act to confirm and establish Articles of Agreement, for a Partition or Division of Lands and Hereditaments, in the Counties of Northampton and Warwick, the Estates of John Clarke Esquire, and Mary his late Wife, deceased; and for settling the same to the Uses therein mentioned." "16. An Act for dividing and enclosing the several Open Fields, Arable Lands, Meadows, Commons, and Waste Grounds, within the Manor of Killamarsh, in the County of Derby." "17. An Act for dividing, allotting, and enclosing the Open and Common Fields, and other Commonable Lands and Grounds, of and within the several Parishes and Liberties of Whilton, Norton, and Brockhall, or in some or One of them, in the County of Northampton." "18. An Act for dividing and enclosing the Common Fields, Common Meadows, Pastures, and Common Downs, in the Parishes of Shireborne and Windrush, in the County of Gloucester." "19. An Act for dividing and enclosing the Common and Open Fields, Common Meadows, and Common Pastures, in the Manor and Parish of Grafton Underwood, in the County of Northampton." "20. An Act for dividing and enclosing the Open and Common Fields, Meadows, Pastures, Fens, Heath, and Waste Lands, within the Manor and Parish of Metheringham, in the County of Lincoln." "21. An Act for dividing and enclosing certain Open Common Fields, Meadows, and other Commonable Lands and Grounds, within the Parish of Candlesby, in the County of Lincoln." "22. An Act for dividing and enclosing the Commons and Waste Lands, and a Stinted Pasture, in the Township of Newsham, in the North Riding of the County of York." "23. An Act for dividing and enclosing several Open Common Fields, Common Pastures, Ings, Common, and other Waste Lands and Grounds, within the Township and Manor of Barmby upon the Moor, in the East Riding of the County of York." "24. An Act for dividing and enclosing several Open Common Arable Fields, Wolds, Commons, and Waste Grounds, in the Townships of North Newbald and South Newbald, within the Parish of North Newbald, in the County of York." "25. An Act for dividing and enclosing the Open and Common Fields, Common Pastures, Common Meadows, and other Commonable Lands and Grounds, of and within the Manor, Parish, and Liberties of Killesby, in the County of Northampton." "26. An Act for dividing and enclosing the several Open Arable Fields, Meadow and Pasture Grounds, and the Common or Moor, within the Township of Thornton, in the Parish of Foston, in the North Riding of the County of York." "27. An Act for dividing and enclosing the Open Fields, Meadows, Common Pastures, Forest, and Waste Grounds, in the Parish of Farnsfield, in the County of Nottingham." "28. An Act for dividing and enclosing certain Open Fields, Meadows, Commons, and Waste Grounds, in the Parish of Brampton, in the County of Lincoln." "29. An Act for dividing and enclosing the Open Fields, Meadows, Commons, and Waste Grounds, within the Parishes of Halam and Edingley, in the County of Nottingham." "30. An Act for dividing and enclosing the Open and Common Fields, Commonable Lands, and Waste Grounds, within the Manor and Parish of Leadenham, in the County of Lincoln." "31. 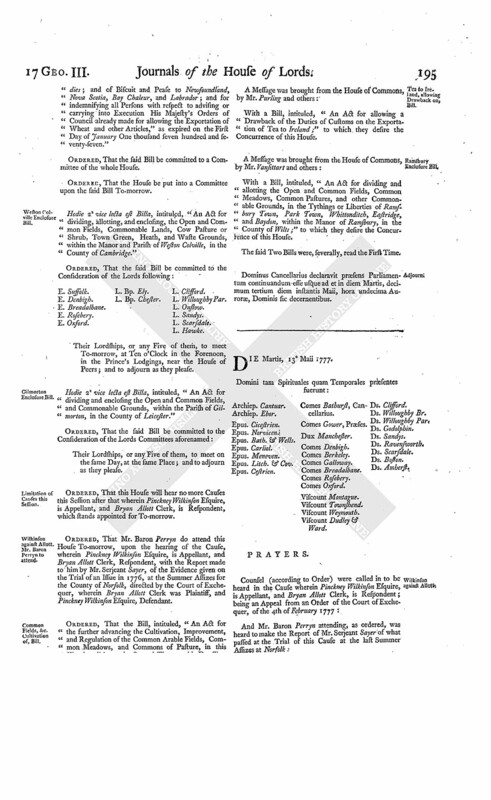 An Act for dividing, allotting, and enclosing, certain Open and Common Fields, Common Meadows, Common Pastures, Downs, Commons, and other Commonable Lands, within the Township of Ussington, and the Hamlets of Balking and Woolston, otherwise Woolverston, and within the Hamlets of Kingston, Lisle, and Fawler, in the County of Berks." 32. An Act for dividing and enclosing the Common Fields, Mesne Enclosures, Commons or Waste Grounds, within the Township of Monkbretton, otherwise Burton, in the Parish of Roystone, in the West Riding of the County of York." "33. An Act for dividing and enclosing the Open and Common Fields, and certain Commonable Lands, within the Parish of Farmborough, otherwise Farnborough, in the County of Berks." "34. An Act for dividing and enclosing the Open and Common Fields, and Commonable Grounds, within the Parish of Gilmorton, in the County of Leicester." "35. An Act for dividing, allotting, and enclosing, the Open and Common Fields, Commonable Lands, Cow Pasture or Shrub, Town Green, Heath, and Waste Grounds, within the Manor and Parish of Weston Colville, in the County of Cambridge." "36. An Act for dividing and enclosing the Moors, Commons or Waste Grounds, within the Manors of Baschurch, Hordley, Stanwardine in the Wood, Weston, Lulling field, and Stanwardine in the Fields, or some of them, in the County of Salop." "37. An Act for dividing and allotting the Open and Common Fields, Common Meadows, Common Pastures, and other Commonable Grounds, in the Tythings or Liberties of Ramsbury Town, Park Town, Whittonditch, Eastridge, and Baydon, within the Manor of Ramsbury, in the County of Wilts." "38. An Act for dividing, allotting, and enclosing, the Open Fields, Common Pastures, and Moor or Common, in the Parish of Bulmer, in the North Riding of the County of York." "39. An Act for dividing and enclosing Corfton Wood, otherwise Corveton Wood or Common, within the Manor of Corston, otherwise Corveton, and Parish of Diddlebury, in the County of Salop; and for making a Boundary or Ring Fence against a certain Open and un-enclosed Ground, in the Manor of Corpham, within the same Parish." "40. An Act for dividing, allotting, and enclosing, the Open and Common Fields, Common Pastures, Common Meadows, and other Commonable Lands and Grounds, of and within the Manor and Parish of Mears Ashby, in the County of Northampton." "41. An Act for dividing and enclosing the Open Fields, Meadows, Pastures, Commons, and Waste Grounds, within the Parish of Bleasby, in the County of Nottingham." "42. An Act for dividing and enclosing the several Commons and Waste Grounds, within the Manor and Parish of Ipstones, in the County of Stafford." "43. An Act to dissolve the Marriage of George Carpenter Esquire, Earl of Tyrconnel, in the Kingdom of Ireland, with the Right Honourable Lady Frances Manners his now Wife, and to enable him to marry again; and for other Purposes therein mentioned." "44. An Act to enable William Dutton Esquire, his First and other Sons, and their Issue Male, to take, use, and bear the Name and Arms of Naper, pursuant to the Will of James Lenox Dutton Esquire, deceased; and for making the Exemplification of the Will and Codicil of the said James Lenox Dutton, under the Great Seal of Great Britain, Evidence in all Courts of Law and Equity in Great Britain and Ireland." "45. An Act to enable Isaac Martin Rebow Esquire, to take and use the Surname of Martin, pursuant to the Will of Matthew Martin Esquire, deceased." "46. An Act for naturalizing Maria Perry." "47. An Act for naturalizing Charles Morris Klanert." Message from H. C. to return Pettus's Bill. To return the Bill, intituled, "An Act for vesting an undivided Moiety of certain Freehold and Copyhold Estates, late of Dame Elizabeth Pettus deceased, in Trustees, to convey and surrender the same respectively, pursuant to an Agreement for the Sale thereof; and for laying out the Money in the Purchase of other Lands and Hereditaments, to be settled to the like Uses;" and to acquaint this House, That they have agreed to the same, without any Amendment. With a Bill, intituled, "An Act for dividing and enclosing the Common Fen, Common Marsh, Common Fields, and Waste Grounds, in the Parish of Surfleet, in the County of Lincoln;" to which they desire the Concurrence of this House. Counsel were accordingly called in, and the said Bill was read a Second Time; and the Petitions against the Bill were also read. Then Mr. Gould was heard against the said Bill, and called James Young; who being sworn, acquainted the House, "That he had known Shapwick Moor ever since he was Eleven Years old, and had lived generally there: That the Commoners put their Cattle in every Part of the said Moor, at all the several Gates he has seen them except One: That he has seen the Chace driven from Coal Pit Common to Halk Moor; that if any of the Cattle so driven prove to belong to the Commoners, they let them go back again to any Part of the said Moor: That none but Shapwick Parishioners cut Turf in Gilbert's Lake; and that the Commoners do not claim a general Right to cut Turf; and that there are several old Houses in Shapwick." Then Richard Poulet was called in; and being sworn, acquainted the House, "That he lives at Street; that he had driven Cattle throughout Shapwick Heath Moor: That he has seen the Cattle belonging to Street at Shapwick Gate; that he has turned Cattle upon the Moor at Three Gates; that they are generally put in at a distant Gate, that they may not stray Home: That he has seen the Chace driven, and Cattle taken away, but those sent back again that belonged to the Commoners, upon their owning them: That the Poor of Walton cut Turf at Sharpham: That Glastonbury Parish cleans Part of the River; Walton Parish cleanses Hull Moor, and Glastonbury Parish cleanses the Ditches before their Grounds: That the Right of Common is claimed for Houses and Plots of Ground." Then John Phillips was called in; and being sworn, acquainted the House, "That he lives at Glastonbury: That he knows Shapwick Moor, and has for several Years put Cattle in at every Gate for all the different Parishes, and at Shapwick Gate." Then Extracts from a Terrier, 6th of Henry the 8th, and also from a Grant from Philip and Mary, were read. Then Mr. Buller was heard in Support of the Bill, and called Charles Wade; who being sworn, produced a Terrier of the Manor of Shapwick, made in February, 6th Henry 8th, and in the 22d Year of Lord Richard, Beere Abbot, which describes a Moor called Heath Moor; and particularly states, that it contains, between the Landshire of Catcott and Litchlake on the West, and the Drove of Shapwick and at Meere, on the East End, Acres; and that the said Moor is divided between Shapwick and Meere, by the Bounds of Glastonbury Twelve Hydes; and that that Part which remains without the said Twelve Hydes belongs to the Manor of Shapwick; and the same was read. And also, A Grant from King Philip and Queen Mary, dated the 3d and 4th Years of their Reign, to Thomas Walton and his Heirs, of the Manor of Shapwick, with all Wastes and Turbaries thereunto belonging; and the same was read. And also, The Copy of a Record of the Court of King's Bench, of Trinity Term, 19th Charles 2d, of a Judgement for the Plaintiff, in an Action of Trespass brought by Sir Francis Rolle against Roman Moris, William Tyler, Simon Dawbyn Junior, and Josias Dabyn, for a Trespass on Northmore, otherwise Heathmore; and the same was read. Then Charles-Strode was called in; and being sworn, acquainted the House, "That he has known Shapwick Common between Fifty and Sixty Years, having lived that Period in Ashcott, proved the Boundary on Heathmore, between Ashcott and Shapwick; that the Ashcott People never dig Turf on Shapwick Moor, nor the Shapwick People on the Ashcott Moor: That he has always understood the Cattle of the People of Glastonbury, Walton, and Ashcott, have fed on Shapwick Moor by wrangling only: That he heard old People, who are dead, say, there was formerly a Law Suit between the Shapwick People and the Ashcott People, because the Ashcott People had dug Turf in, or within the Shapwick Boundary, and that the Shapwick People recovered in such Action; and that therefore the Ashcott People have not since dug within the Shapwick Boundary: Never knew any other than the Shapwick People stock on Shapwick Moor." Then Charles Stock was called in; and being sworn, acquainted the House, "That he has lived at Shapwick almost Sixty Years; has gone Processions of Shapwick Parish, proved the Boundary between Shapwick and Ashcott: No Cattle of any other People than of Shapwick reputed to have Right of Common on Shapwick Moor, otherwise than by wrangling; never knew any others stock on the Moor; has dug Turf on the Moor, but no People of Ashcott, &c. dare dig Turf there." Then Champeny Rock was called in; and being sworn, acquainted the House, "That he has Three Tenements in Glastonbury which have Right of Common on Glastonbury Moor; proves the Boundaries of Glastonbury on the Moor: No People of Glastonbury ever till now claimed Right of Common on the Shapwick Moor; has heard many Glastonbury People declare, they did not consider themselves as having any other than a wrangle Right on Shapwick Moor; he does not pretend to any other himself, nor ever did: Has known Shapwick Moor many Years, and never knew any but the Shapwick People stock on it." Their Lordships, or any Five of them, to meet on Wednesday, the 28th Day of this Instant May, at the usual Time and Place; and to adjourn as they please. Ordered, That all the Lords who have been or shall be present this Session, be added to the said Committee. Dominus Cancellarius declaravit præsens Parliamentum continuandum esse usque ad et in diem Martis, vicesimum septimum diem instantis Maii, hora undecima Auroræ, Dominis sic decernentibus.